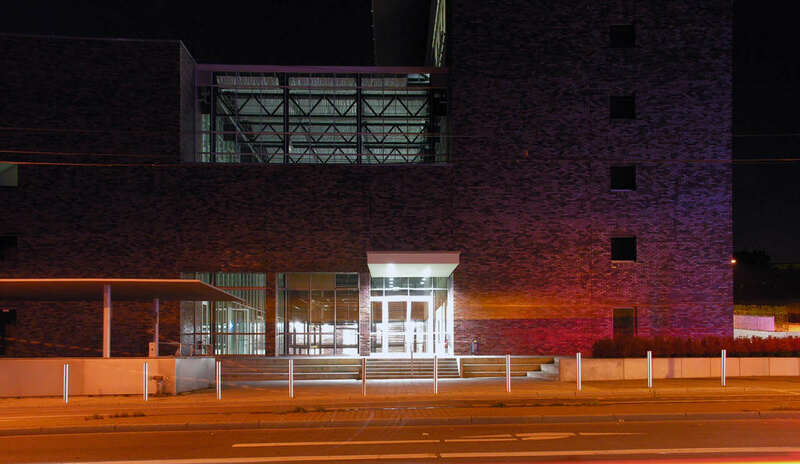 The project is a new, 18,800 sf laboratory and classroom building on the Academic Technical Center campus of Hinds Community College in Jackson, Mississippi. 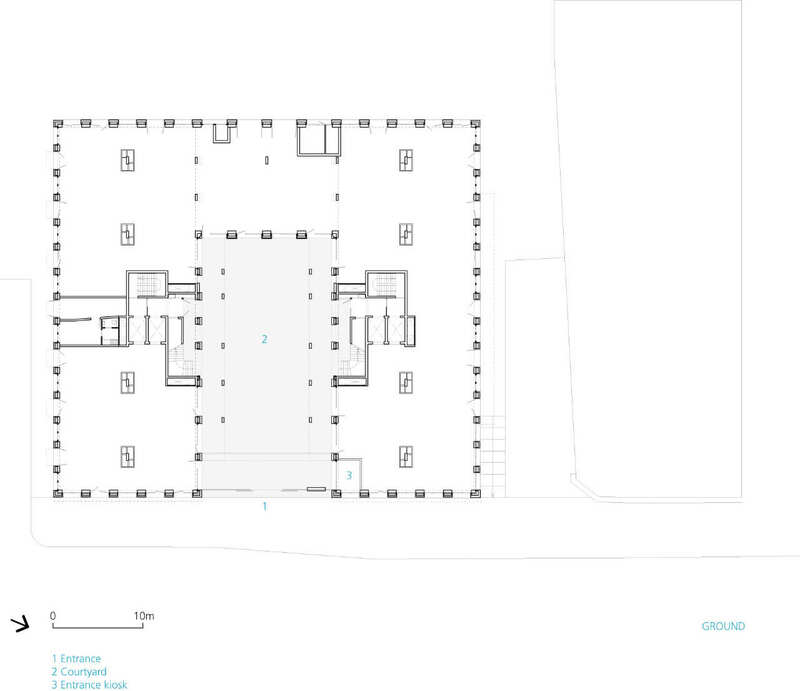 It includes six standard classrooms, biology and chemistry laboratories, faculty offices, and study areas. 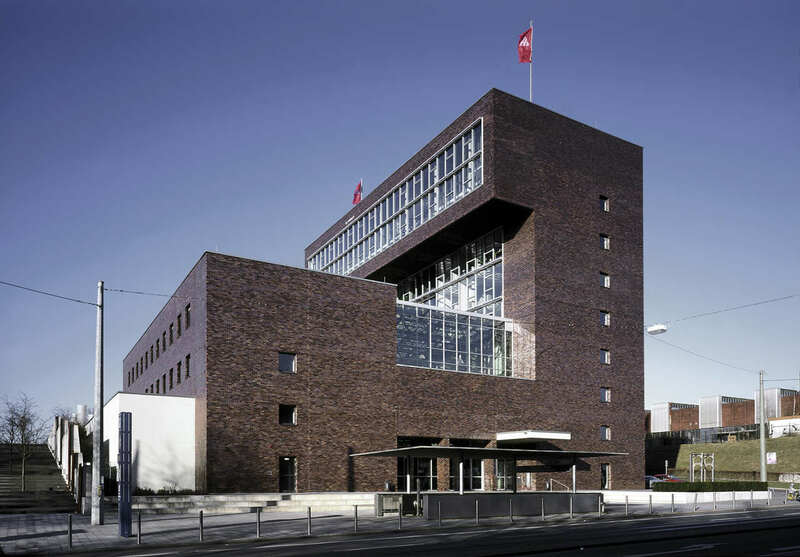 The fastest growing satellite campus of the college required a workhorse building; economical, durable, energy-efficient and functional. 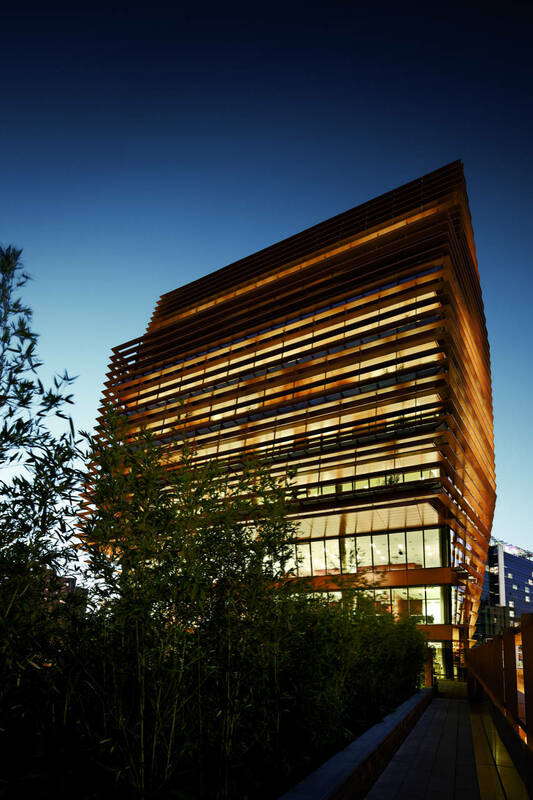 The new building, sited to shape a future campus green, fits in this understated and pragmatic context, but it also elevates the prospect of the campus. 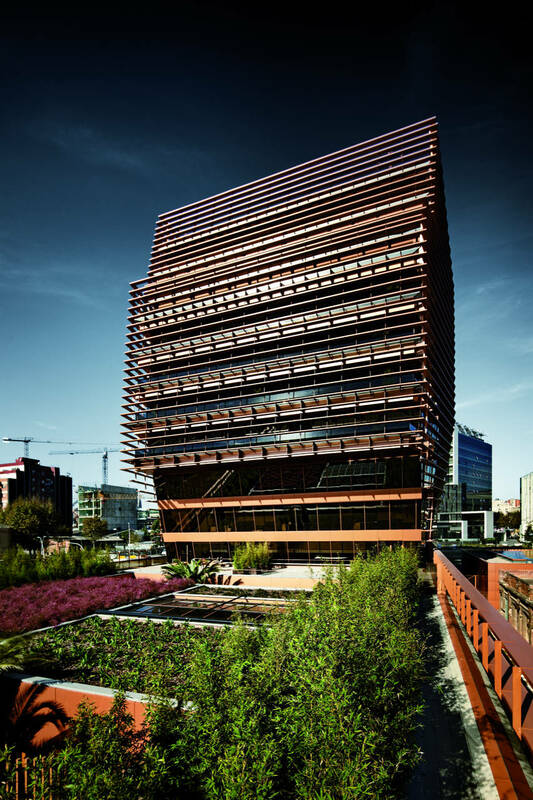 The building is ecologically mature, reducing energy consumption through active and passive strategies. 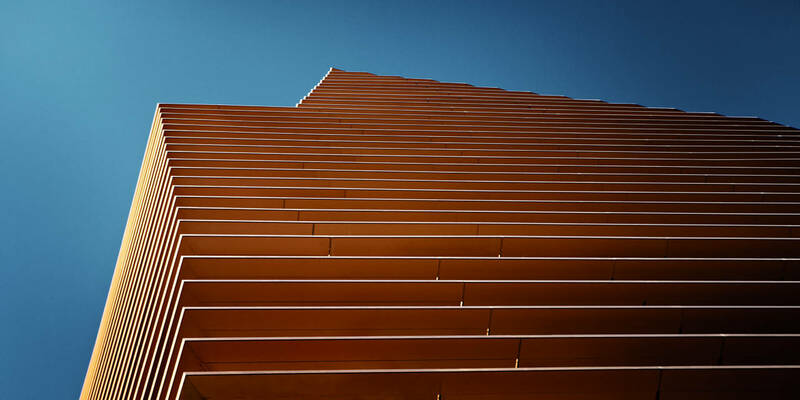 As external heat gains generally outweigh internal loads here, an umbrella shadows the building. 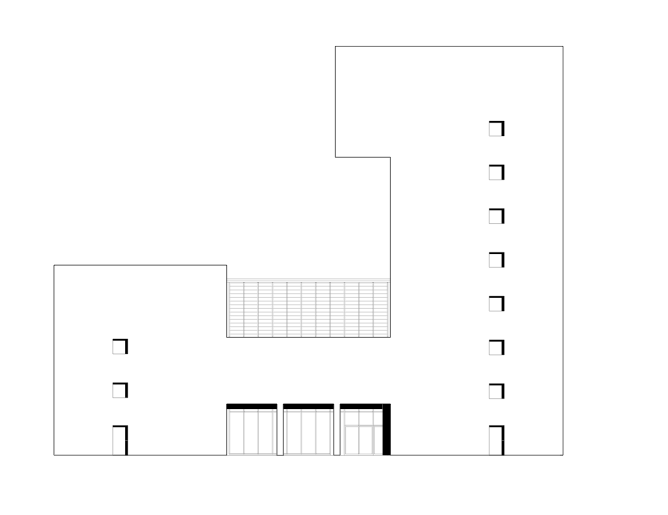 Convection facilitates the movement of air up the southern, eastern and western facades, through the attic and out to the north. 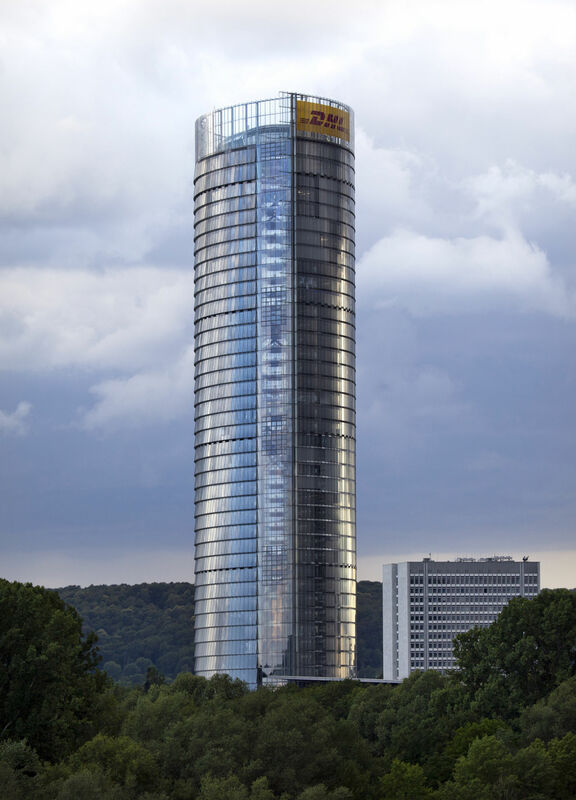 The heat given off through the first layer of construction never penetrates the thermal envelope of the building. 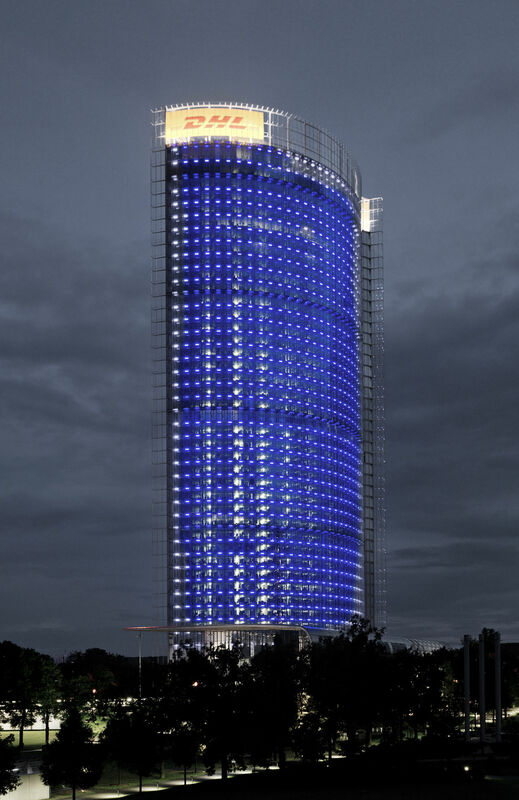 The primary active strategy reduces the electrical lighting load, the greatest consumer of energy in most buildings. 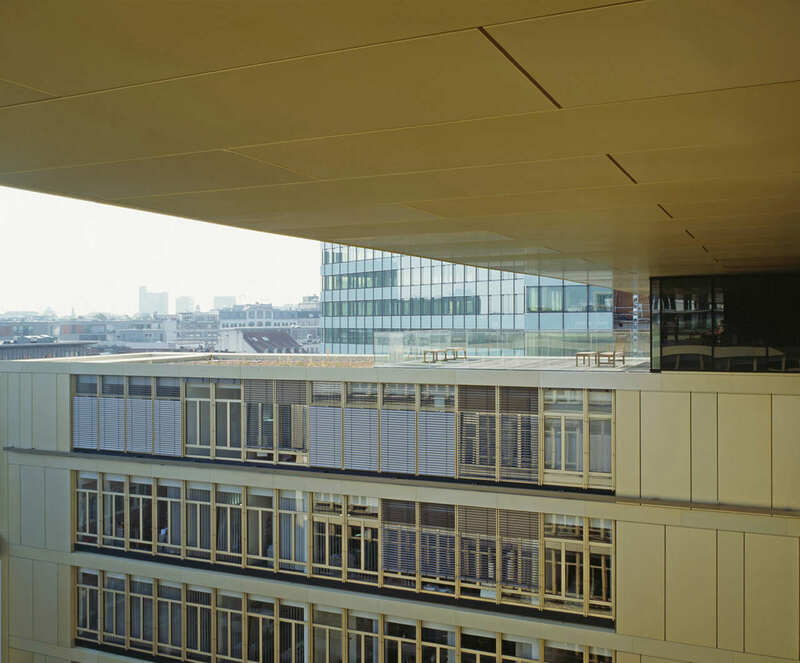 The classrooms and laboratories line the north side of the building, which is enclosed with a high performance curtain wall. 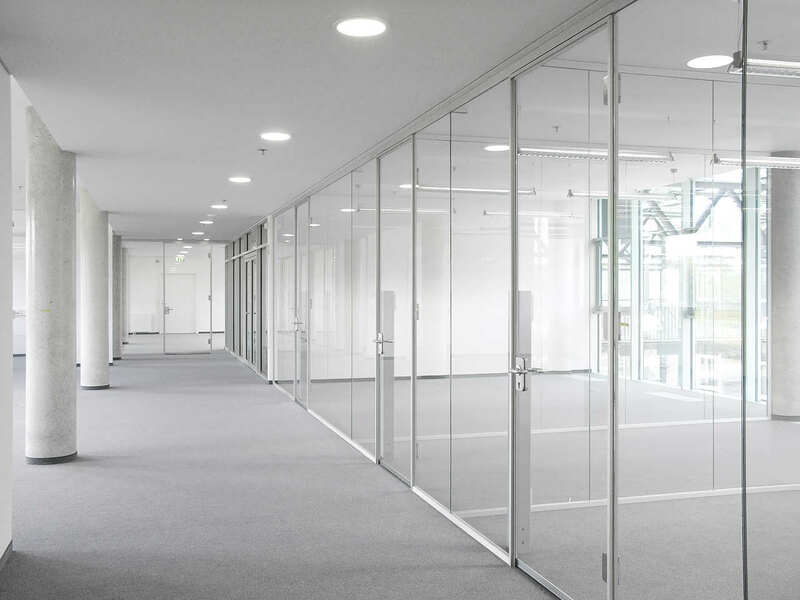 This wall is a natural light diffusing lens that refracts light deep into the room and onto all of its surfaces. 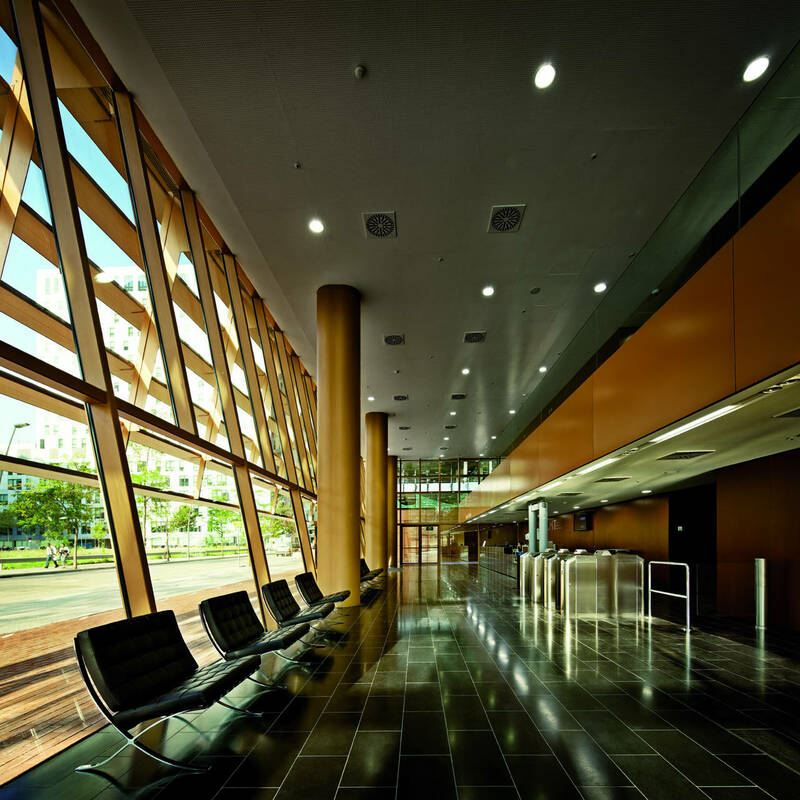 The artificial lighting is an efficient light harvesting system which is controlled via motion and light level sensors. 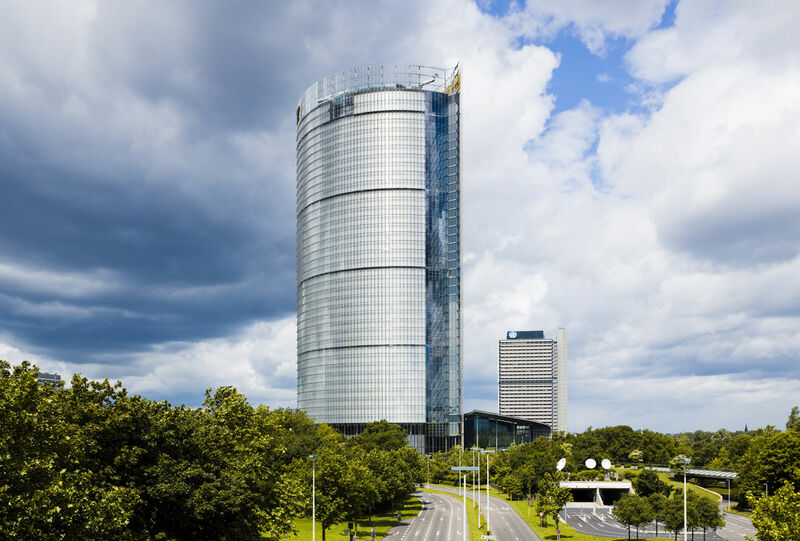 A high performance, zoned HVAC system takes advantage of the reduced loads and provides thermal comfort with minimum energy. 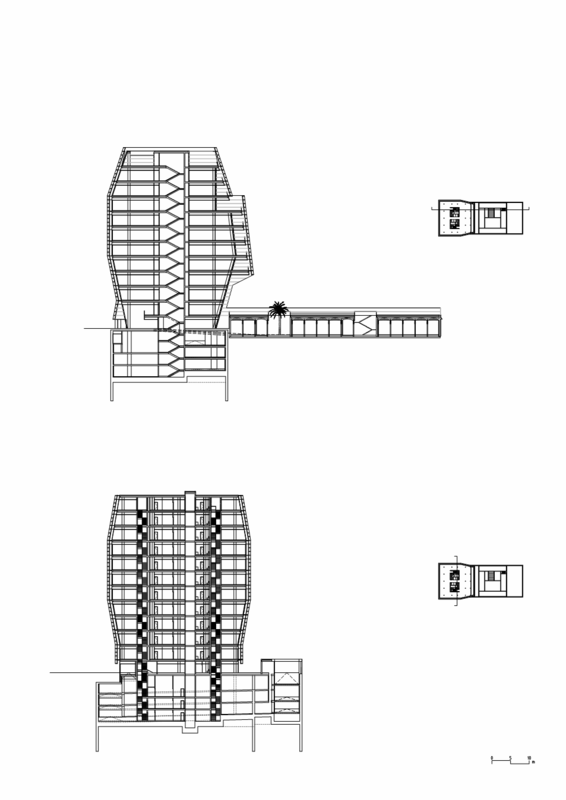 The planning of the building allows for simple trunk line runs, efficient HVAC zoning, and ease of maintenance. 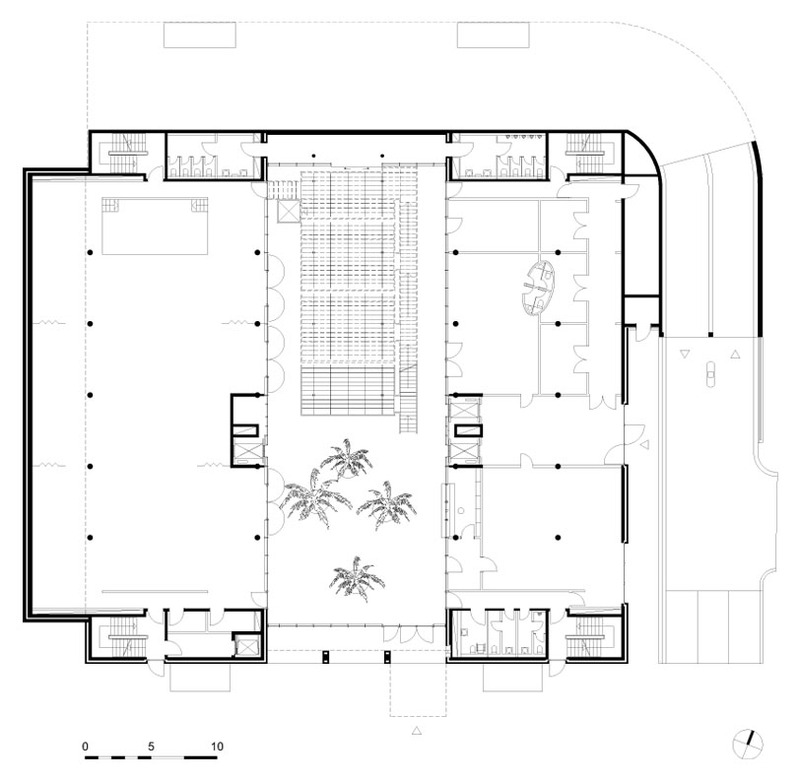 The southern side of the building accommodates lounge, circulation and study spaces. 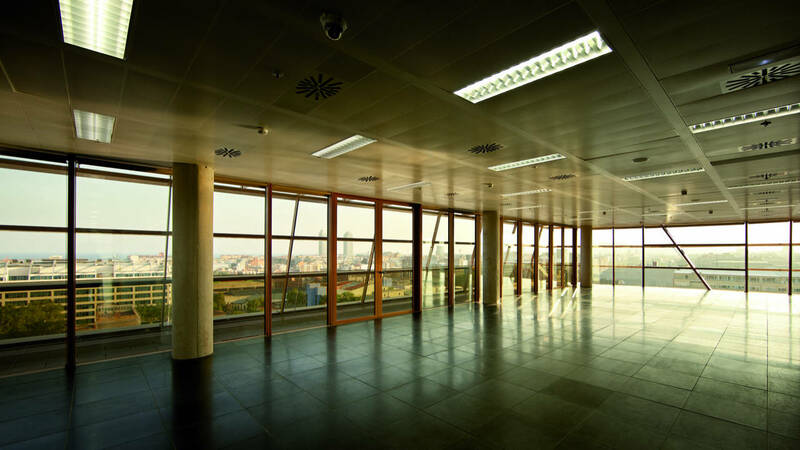 Natural light enters the building through four penumbra instruments. 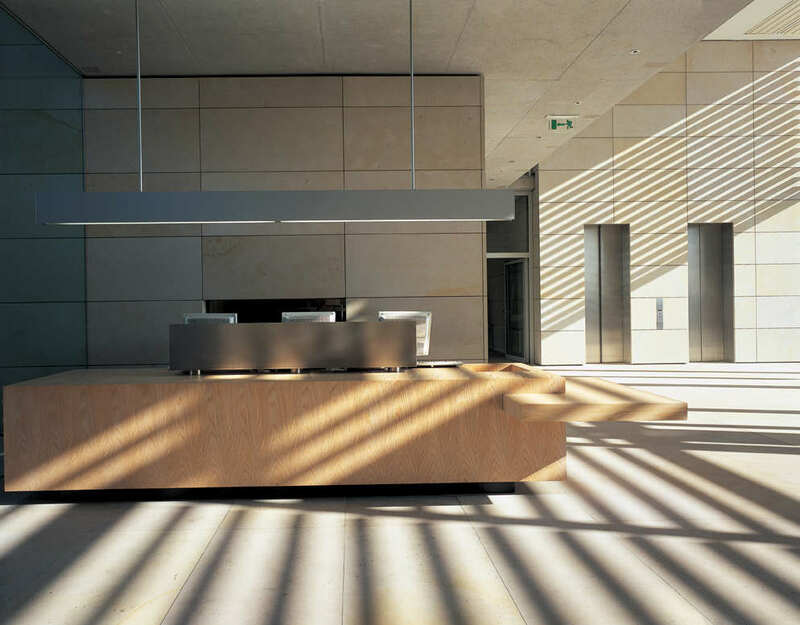 Direct light is transformed into an ever-changing play of shadow and southern reflected light. 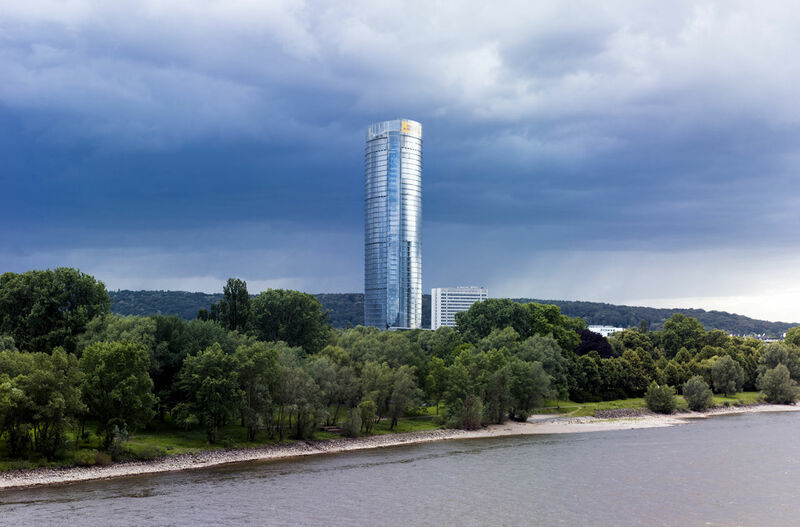 The split, shifted oval is oriented to the Rhine, Siebengebierge and the city, facilitates views from the city, and minimizes negative wind effects through its aerodynamic shape. 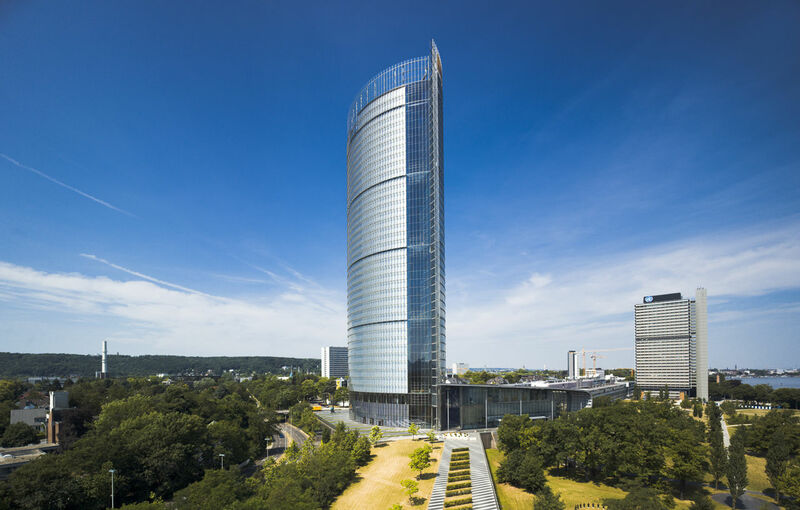 The building rethinks the type of high-rise office tower in relation to function, technology and user comfort. 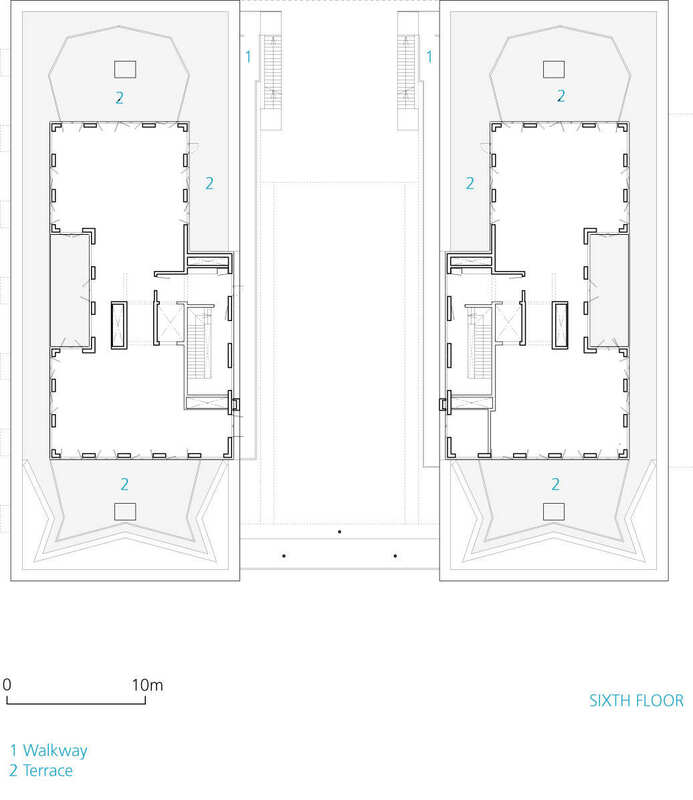 In plan the split oval halves are separated by a 7,20 m wide space. 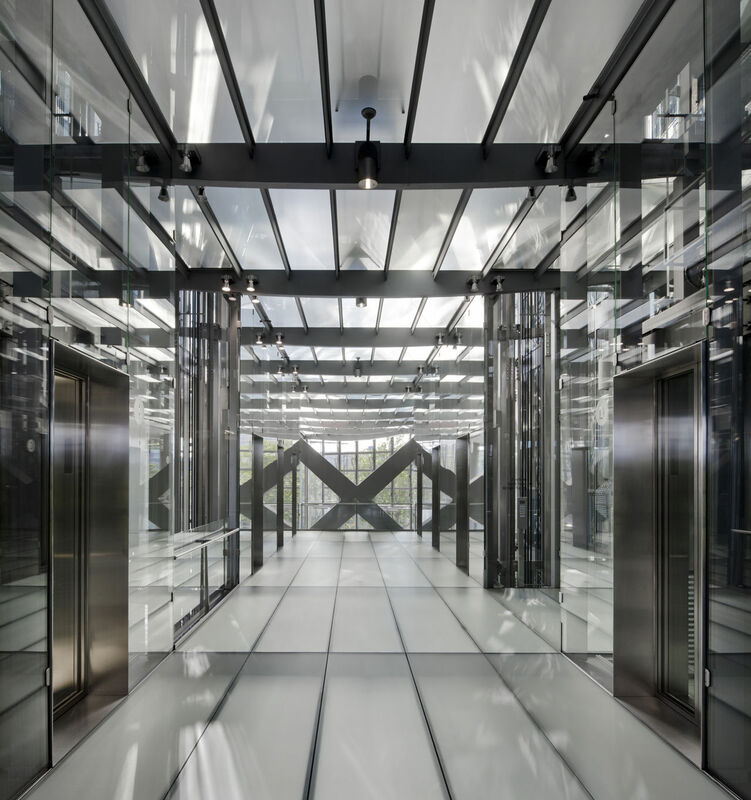 The connecting glass floors at 9-story intervals form skygardens, which serve as communication floors and elevator crossovers. 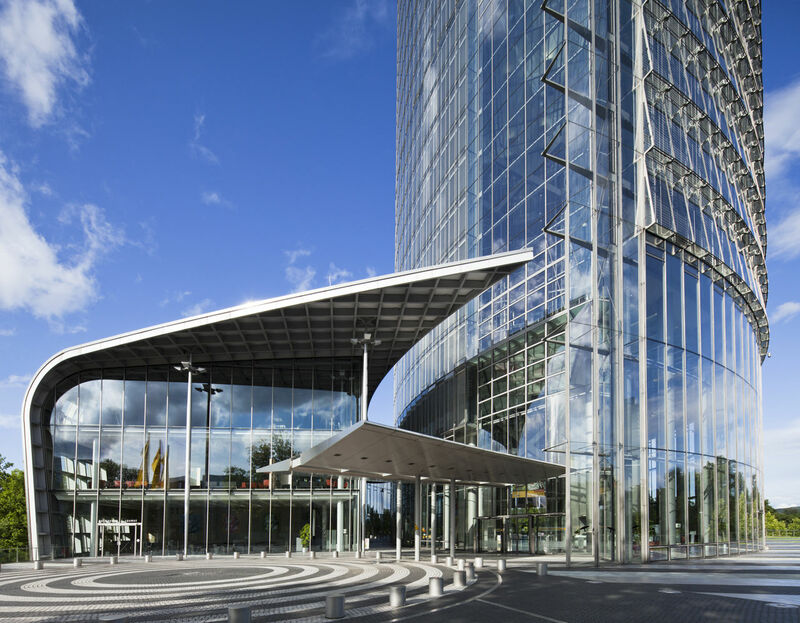 The glass elevators of the low and high zones run in the center of the skygarden, providing views and orientation.The building has a twin-shell façade. 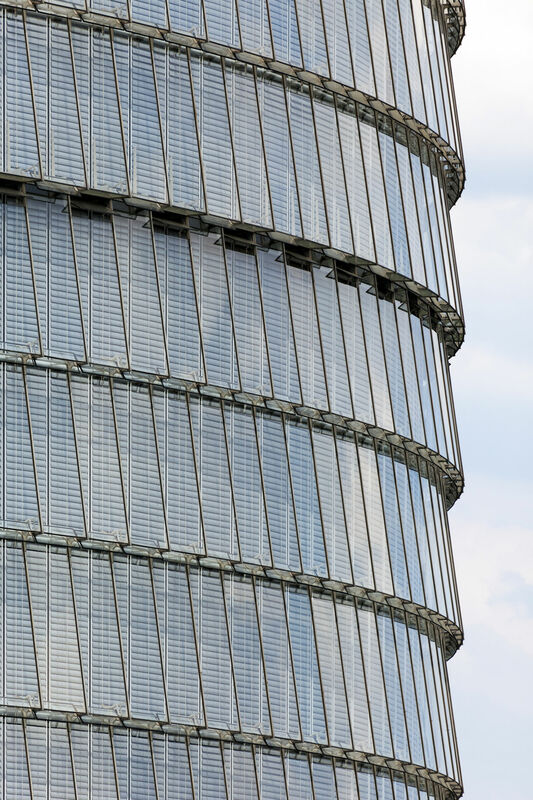 The outer shell is completely out of glass, enabling natural ventilation, especially in the spring and fall. 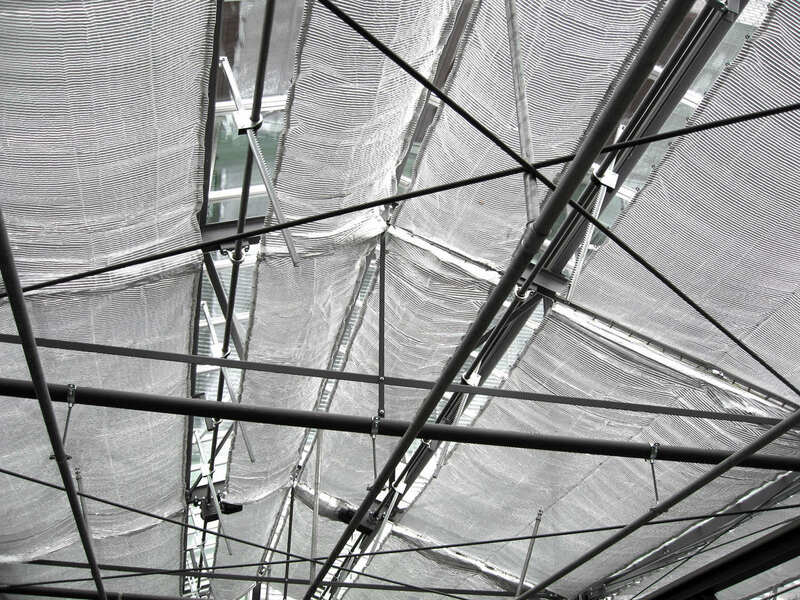 The outer shell protects from rain, wind and noise and allows for placement of the sunshades. 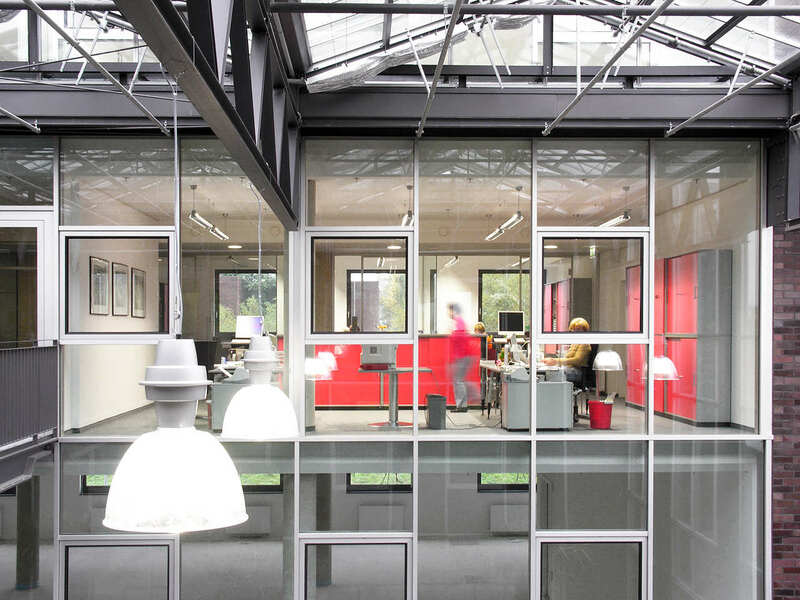 Glass from floor to ceiling optimizes daylight. 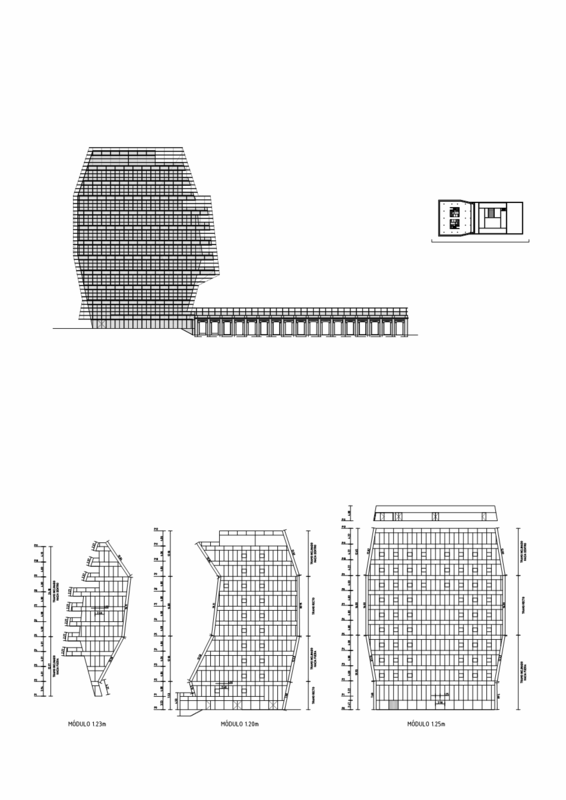 Cost comparisons show that the total cost of climate concept and twin-shell façade is equal to a conventional system. 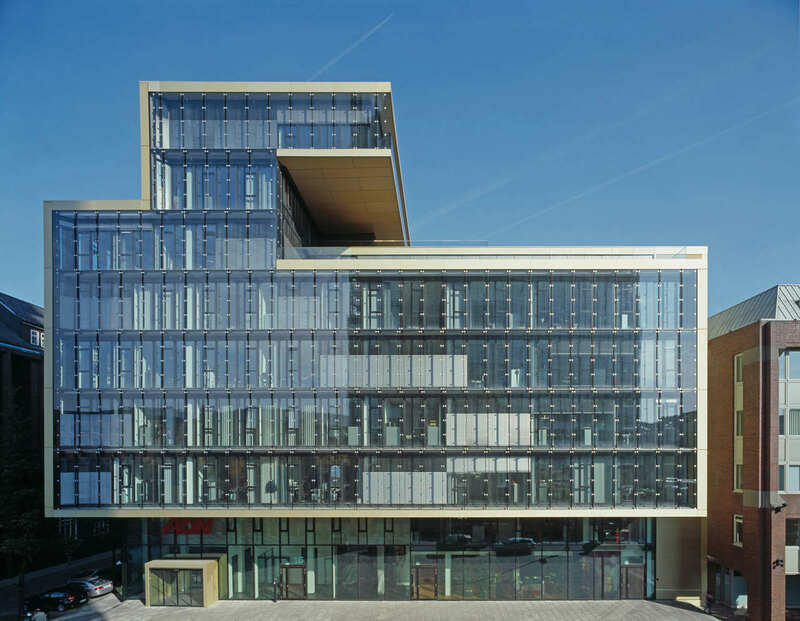 Operating costs are reduced by 60%.Daylight, natural ventilation, solar energy and the idea that the skin of a building modulates its own climate have not yet been integrated as essential components in commercial design. The inclusion of these methodologies is the goal here. Through this, we can rediscover and fulfill our natural instincts and intuitive actions. 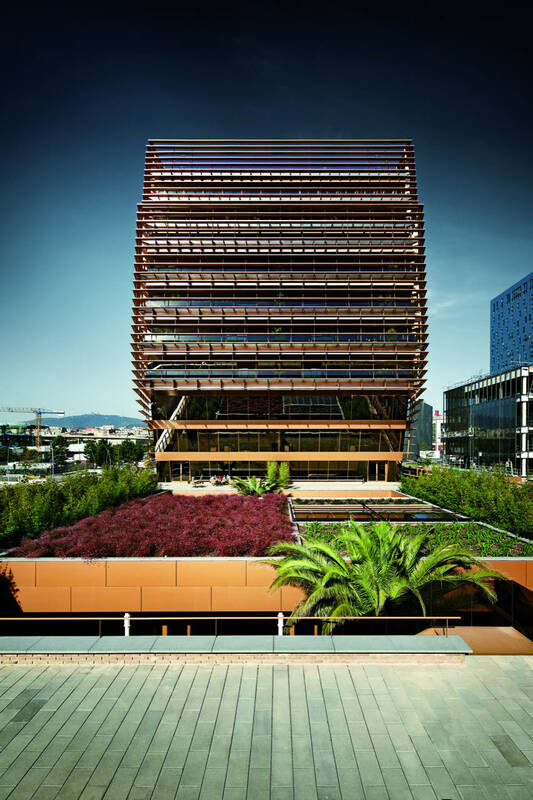 The result: A building with high technology and low energy. 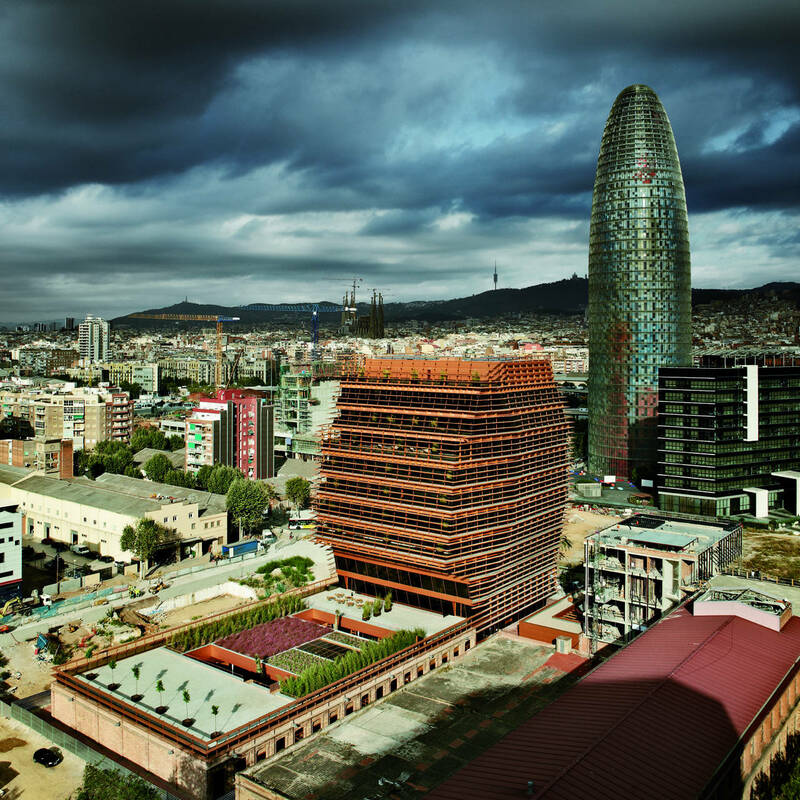 This project, for which the competition occurred in 2008, is the result of a complex transformation process in the city along with a precise economic context. 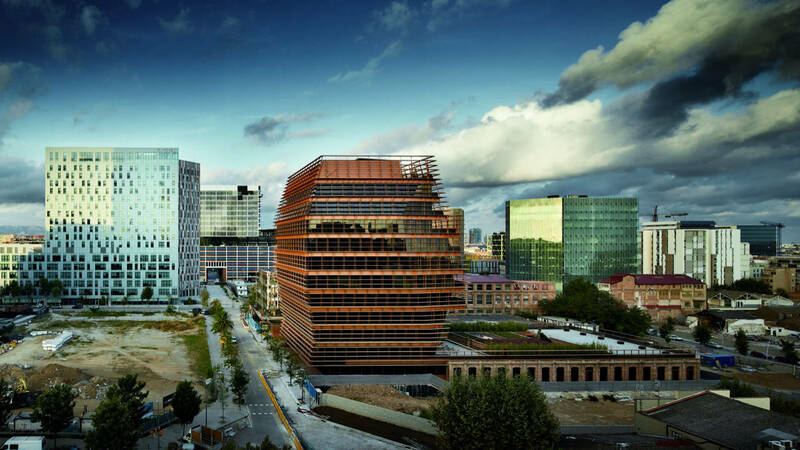 Located on the former site of the Renault factories in Boulogne-Billancourt, the concerned project is part of the Trapèze Ouest, one of the sector of the operation Ile Seguin-Rives de Seine, amongst the most important emerging centres in Ile-de-France. 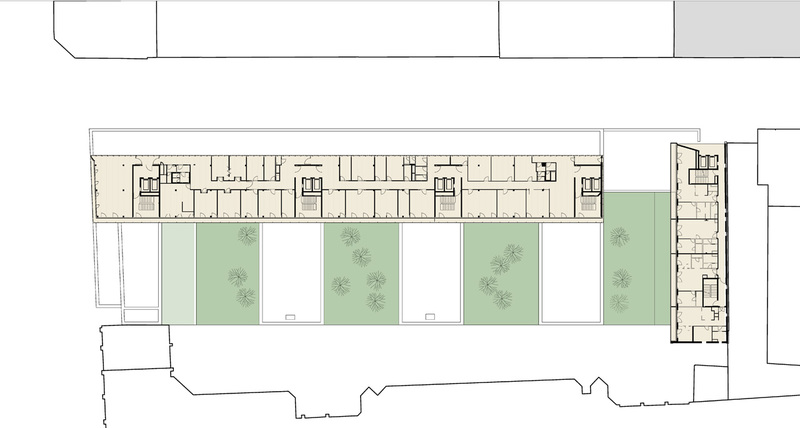 It consists of a new mixed use neighbourhood, residential space on the immediate west side of Paris. 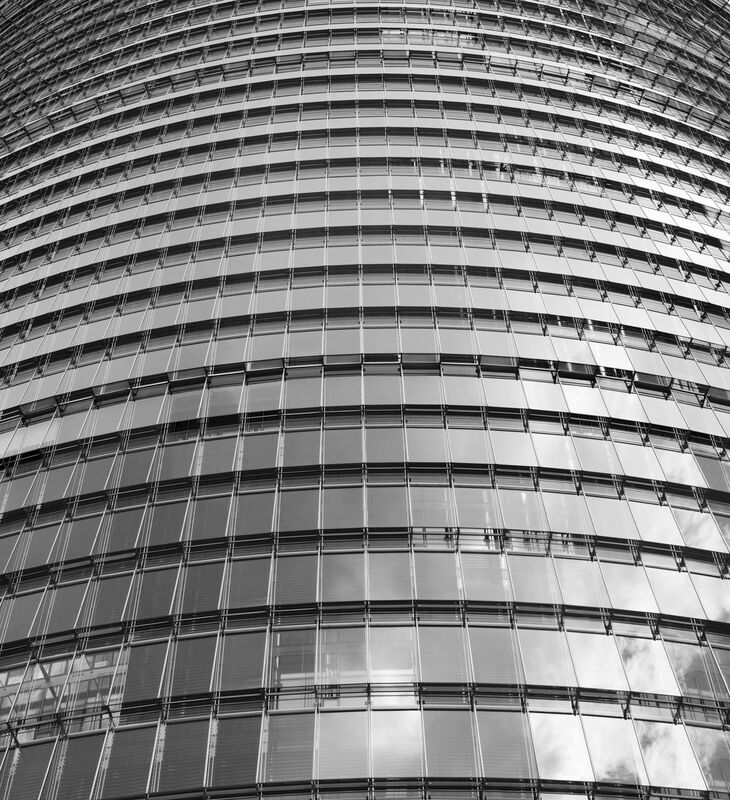 In this territory, public and private interests are evidently bound to cross. 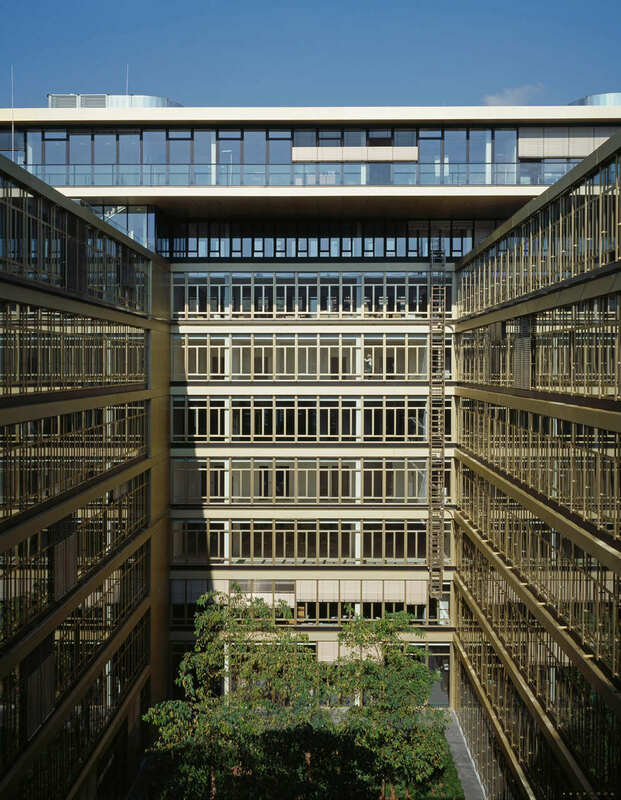 The segregation of disciplines omnipresent in the french system is antagonistic to this approach and it is manifested in the clear separation between the practices of urban planning and design, architecture, landscaping and project management. 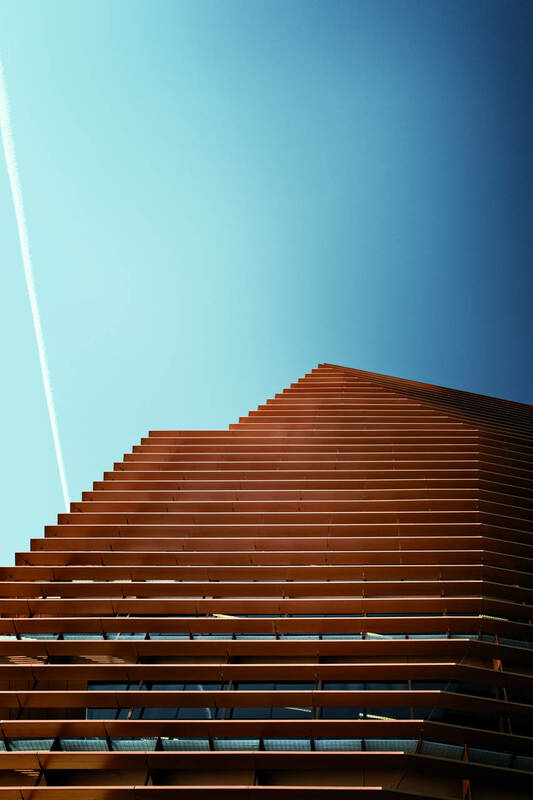 Certainly, collaboration is existent, but the large number and diversity of participants causes a normalized rarity in the points of intersection between the many different visions. 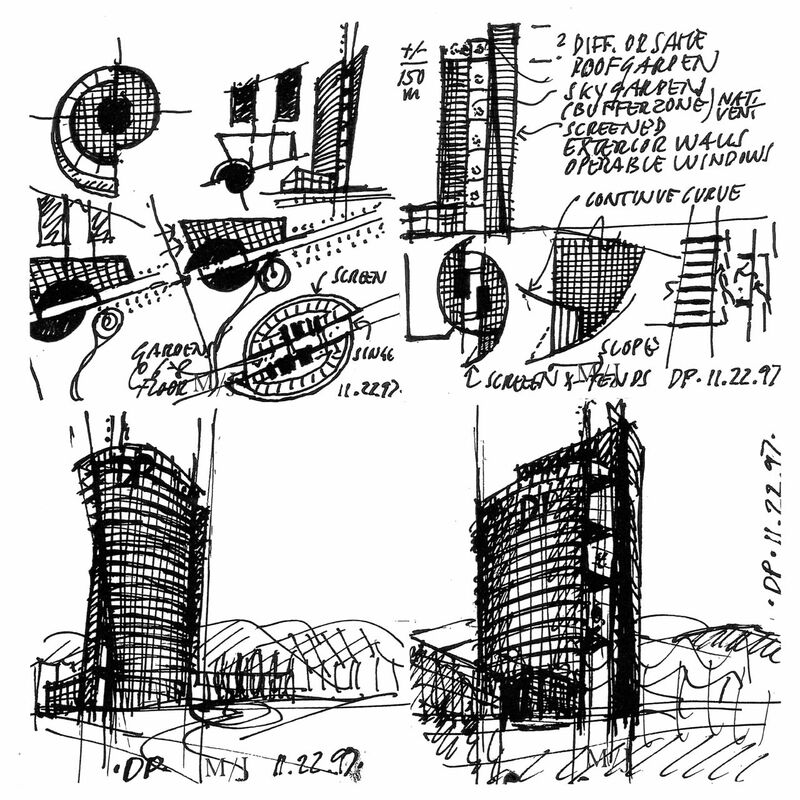 A programme and volumes rigorously defined, diminished costs of construction, the hit of an economic crisis, a private real estate system that isolates the site designer, strict certification labels… this abruptly depicted a reality, that any idea, vision or architecture is one day bound to face. 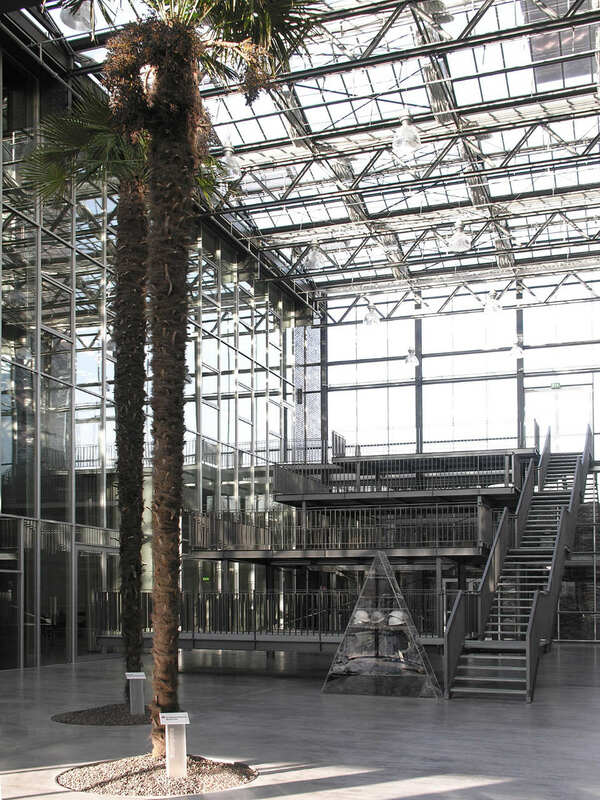 The first step of our work consisted in drawing from this hostile context a fruitful questioning: « In a framework where the ability of the architect is knowingly limited and in a context where economic conditions are uncertain, how to imagine an architecture capable of resisting disruptive change? That can reassure in moments of instability? And face situations of crisis? 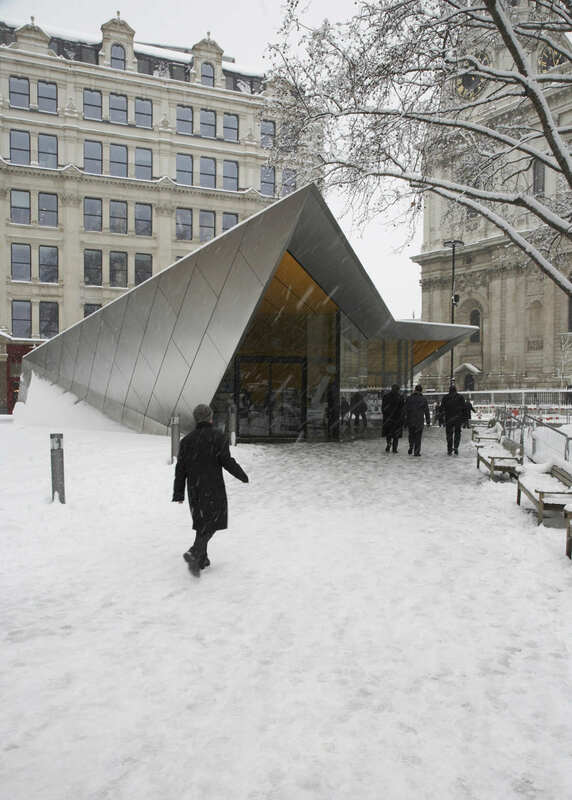 An architecture that can justify itself by itself and in any moment? What would then be the cardinal values on which to base our intervention? ». In difficult moments, one must return to fundamentals and choices are narrowed: it is simply survival instinct. 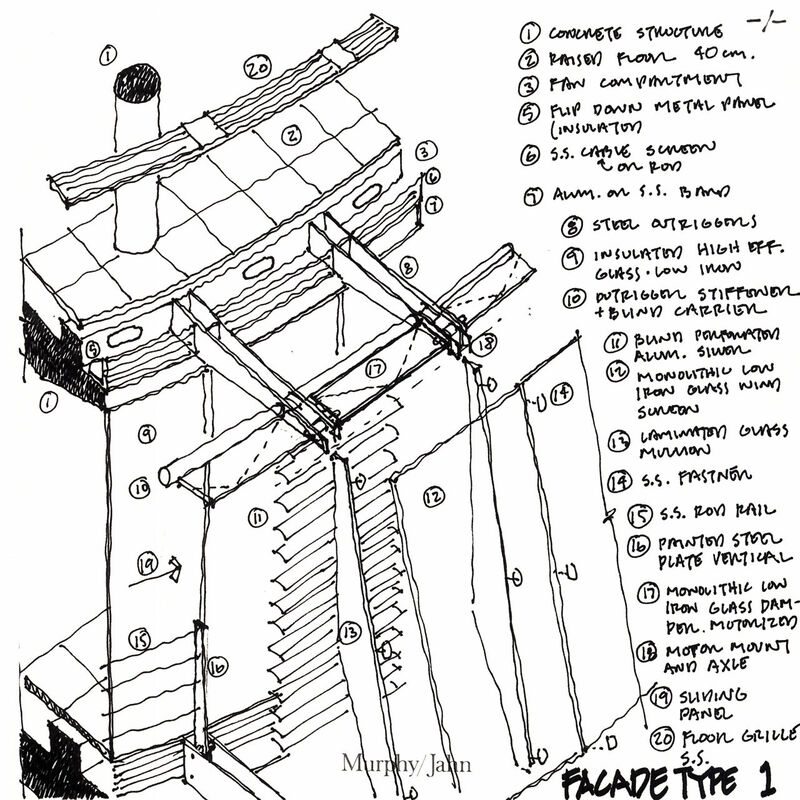 With this projects we decided to face the most challenging scenarios from the very first sketch. 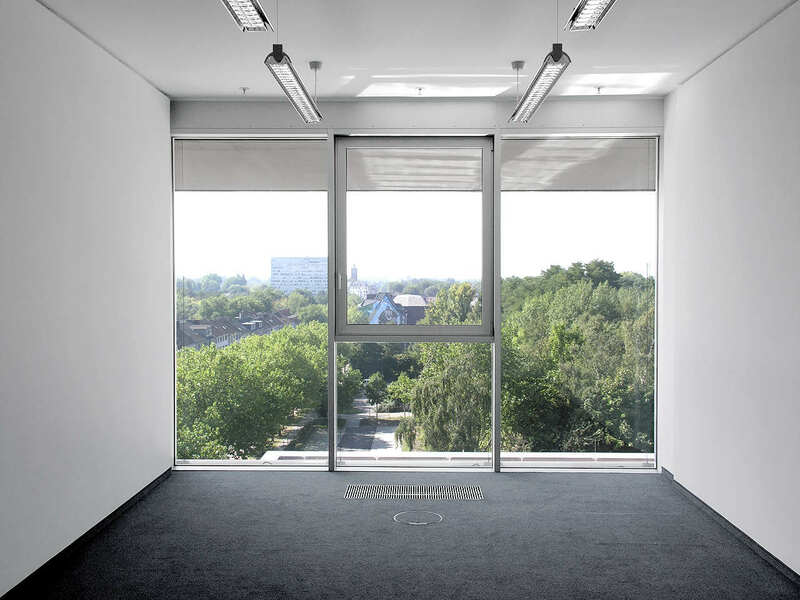 In this operation we have let aside exhaustive studies on urbanity and potential grabbing –costly and previously explored methods at the agency–, to pivot back around an essential postulate: a space exists only if it is built. 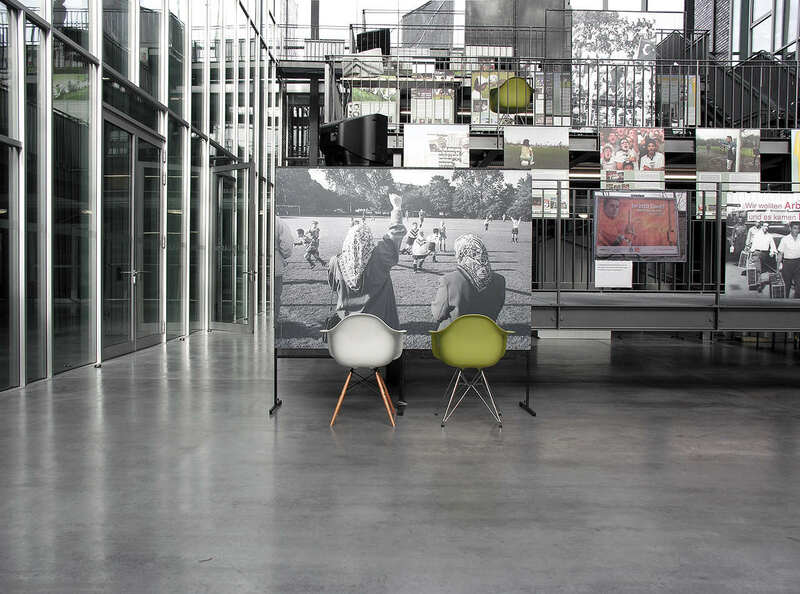 Simplification, substraction and timeless values drew the three guidelines for 70° Sud, whose name was chosen by the client’s Marketing team. 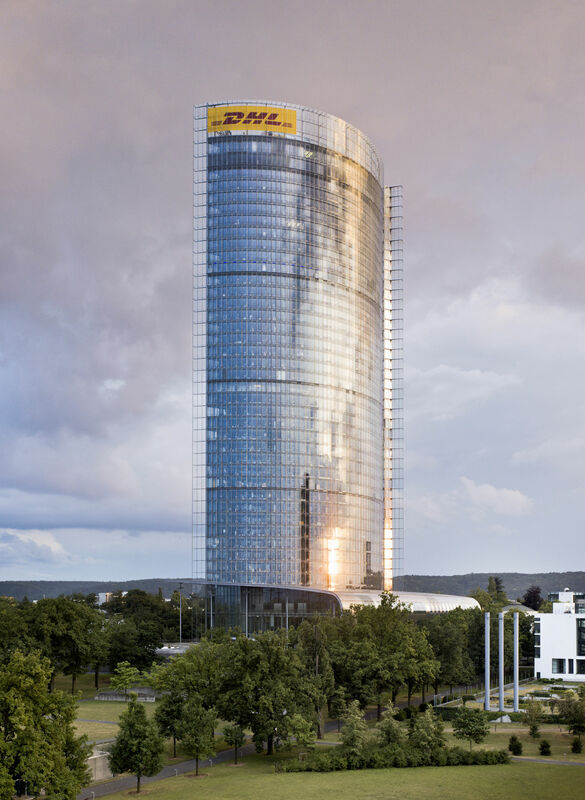 Simplification: from a technical point of view, a way to reduce cost. 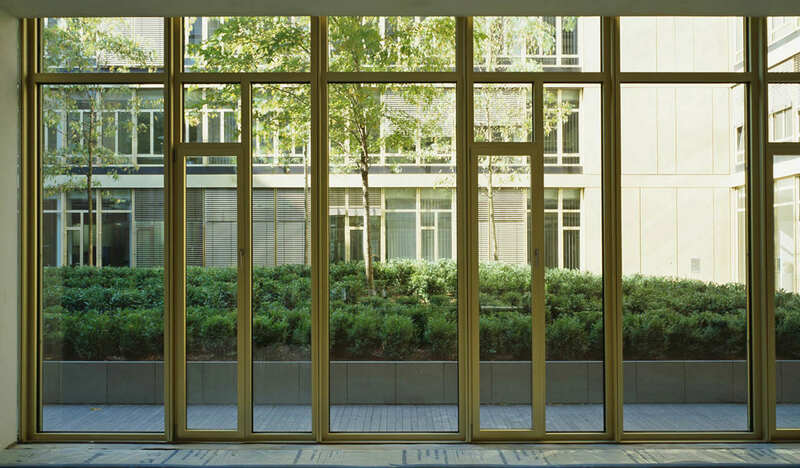 A single detail drives the wholeness of the project: window–corridor-–railing. 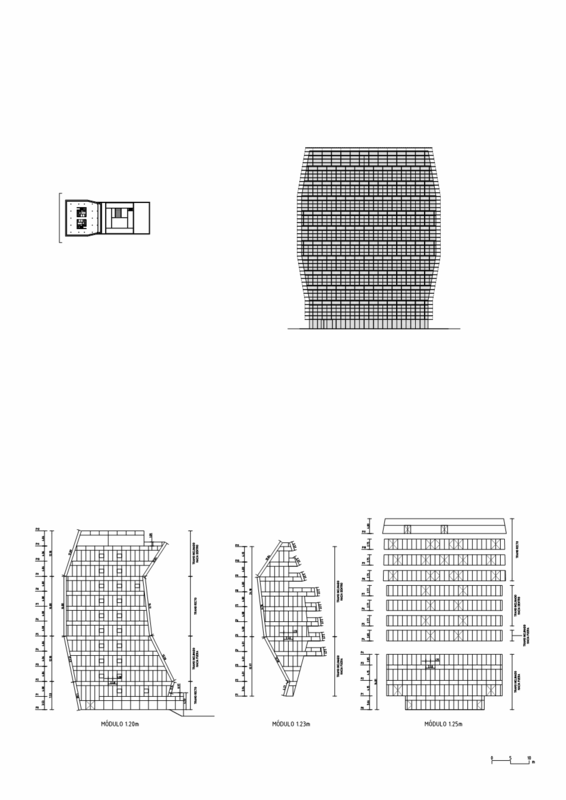 Within this ensemble, we can also include solar protections and openings. 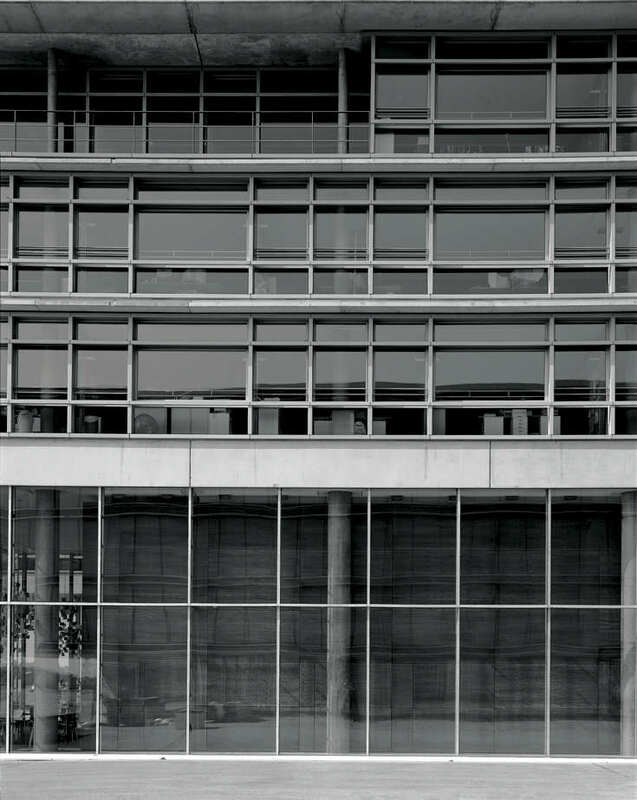 Substraction: the structure becomes façade, exposed concrete, no superfluous elements, no gratuitous ornement. 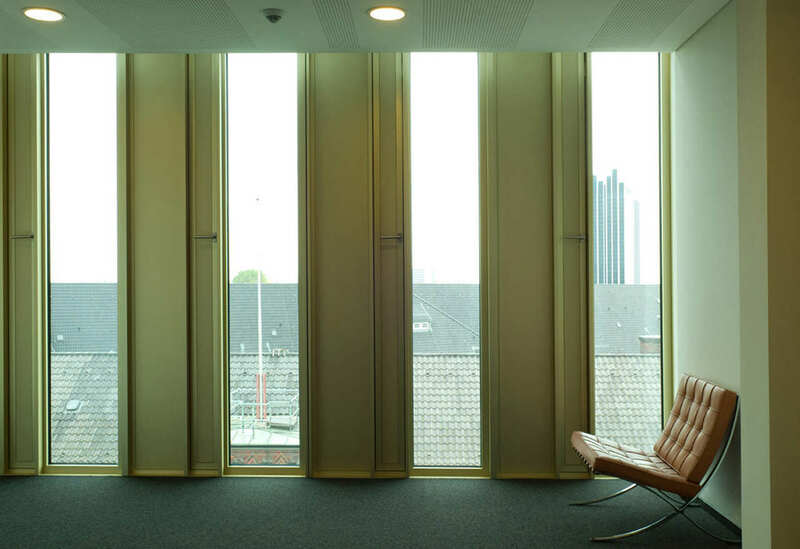 Timeless values: to attract people, the strategy put into place is found upon incontestable building qualities: light, orientation, views and organization. 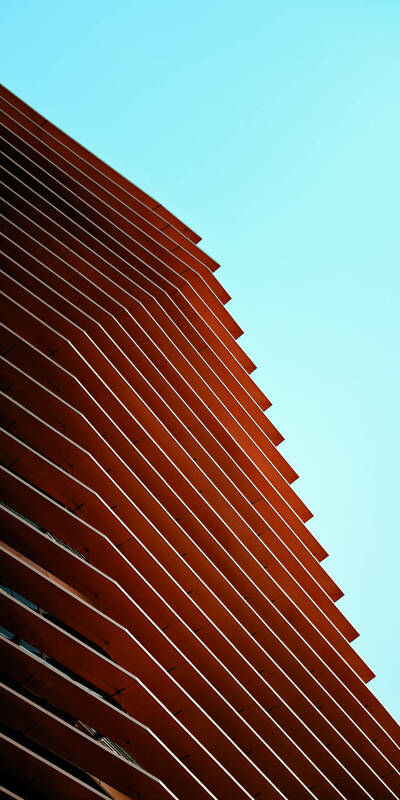 If each individual is allowed to act upon his dwelling in regards to his own taste and needs, the fundamentals that make for quality are, in this building, unchangingly insured. 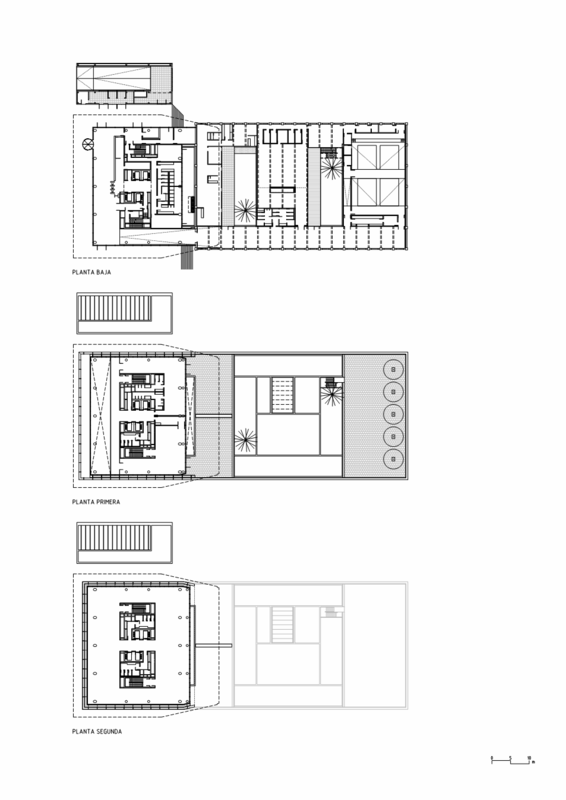 The project suggests a built form that is simple and readable. 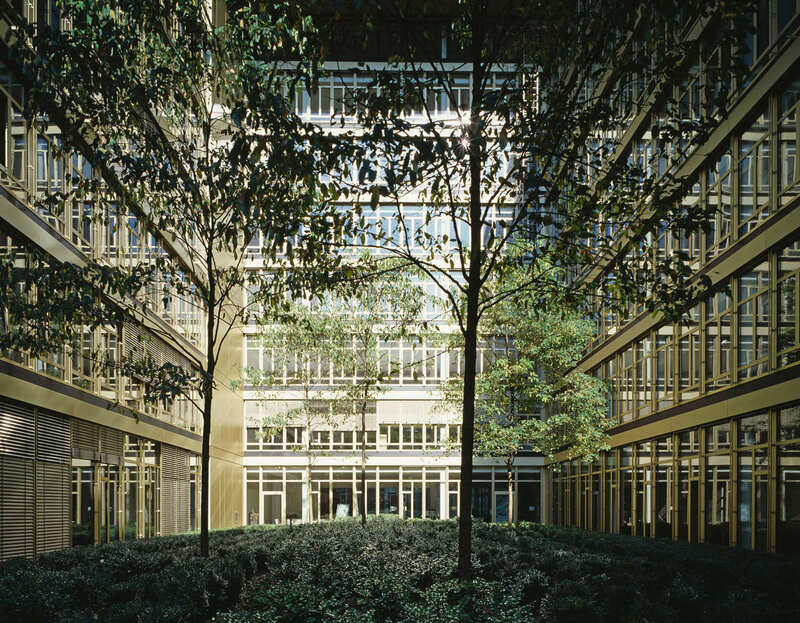 The South and East façades are punctuated by multiple larges openings, extending the interior of the dwellings to exterior corridors running along the building. 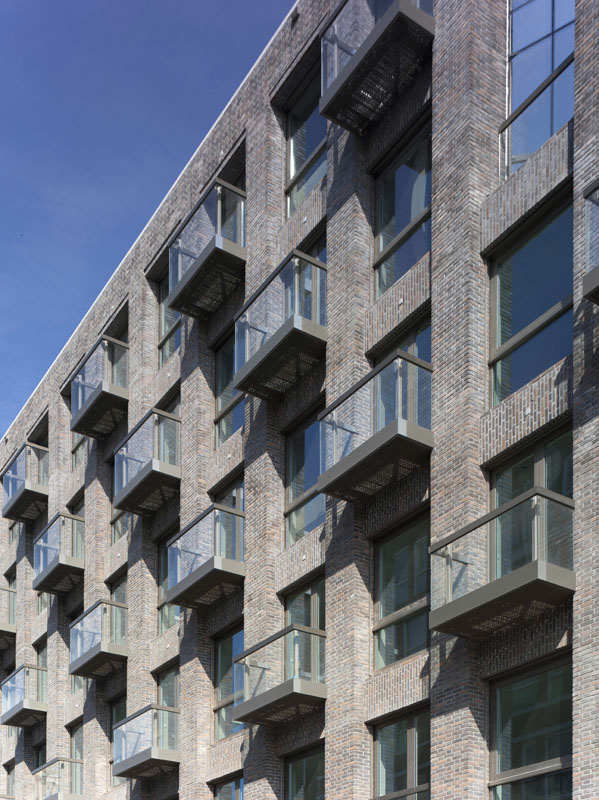 Larger balconies are inserted at intervals in the line of the terraces, projecting out. 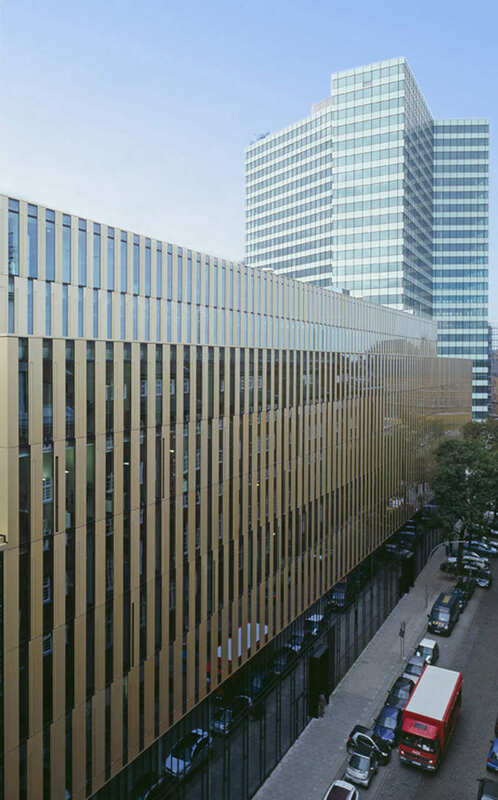 The juxtaposition of protruding, punctual and linear elements give the impression of a slender and lighter building onto Yves Kermen and Emile Zola streets. 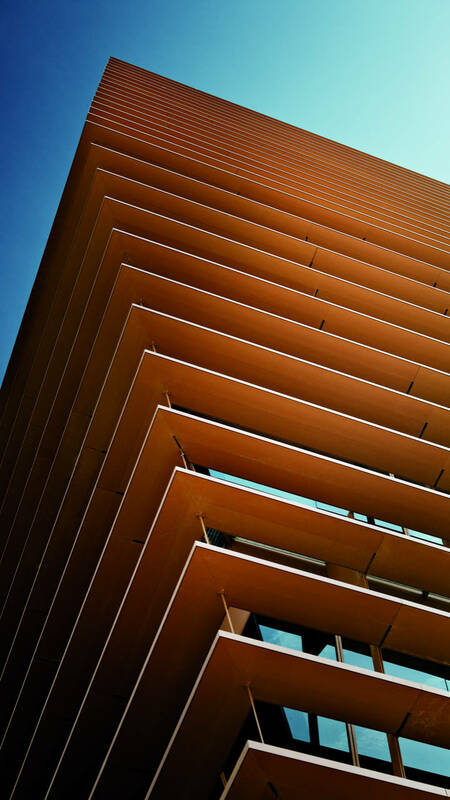 The building fulfills its role as a corner element and provides a clear distinction from the surrounding buildings. 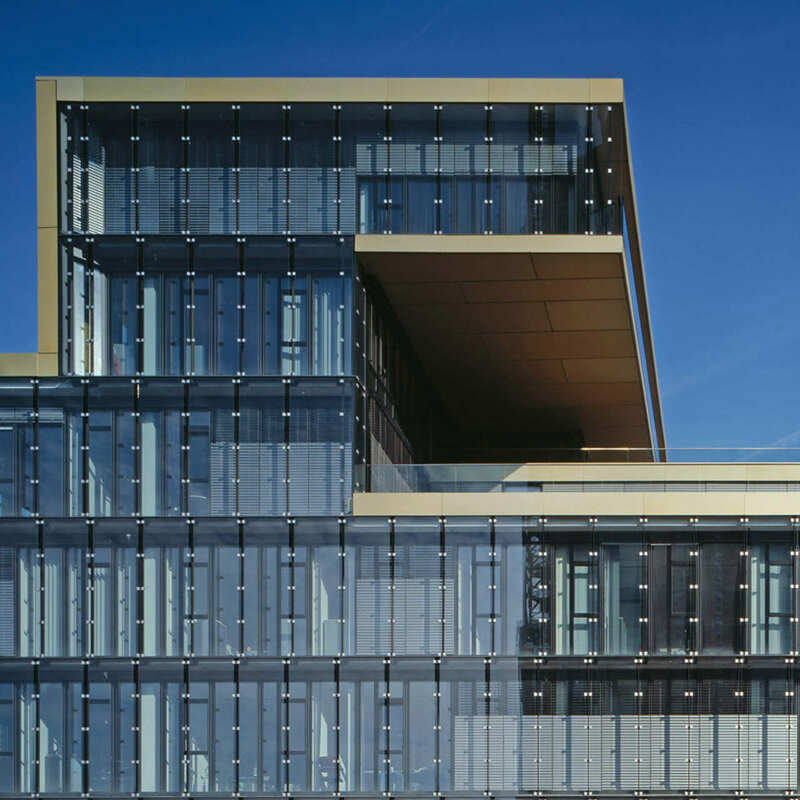 Plays with solids and voids, horizontals and verticals, light and shadow, glass and curtains, give the façade both sobriety and animation. 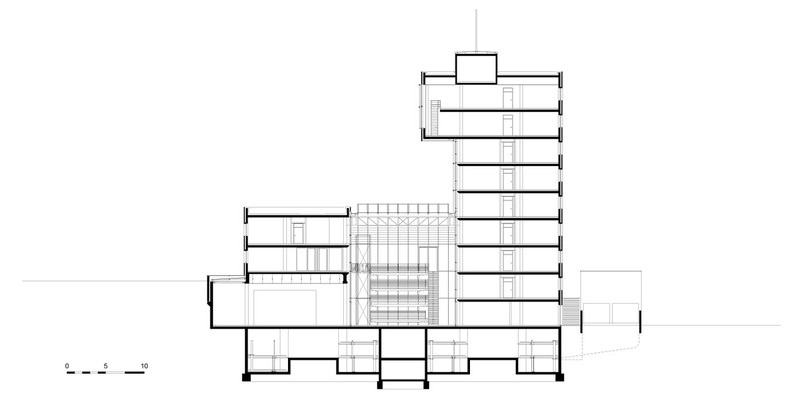 To the simplicity of the drawing is added the richness of the material. 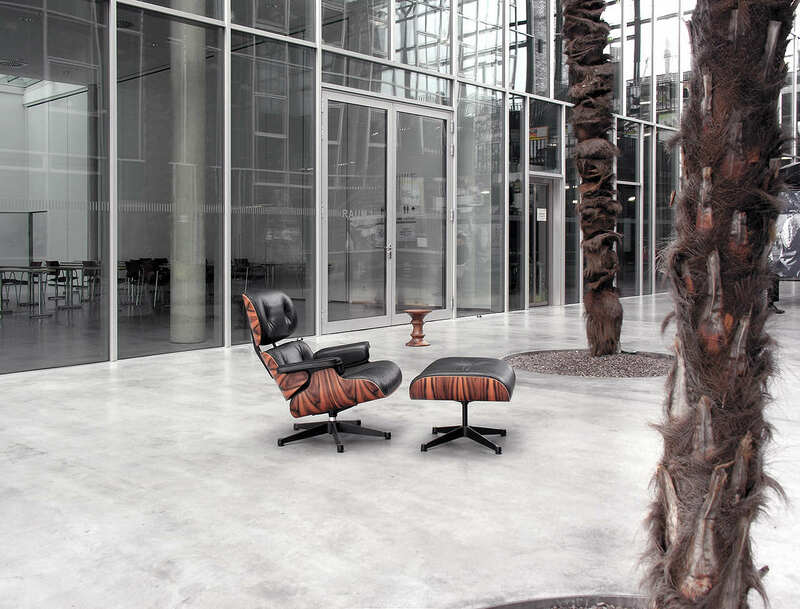 We have sought for a finish that is clean, shaven and refined but rich enough to reflect light, and communicate with the colours of its environment. The circulation system is very clear: four vertical circulation points on the four corners of the plot. 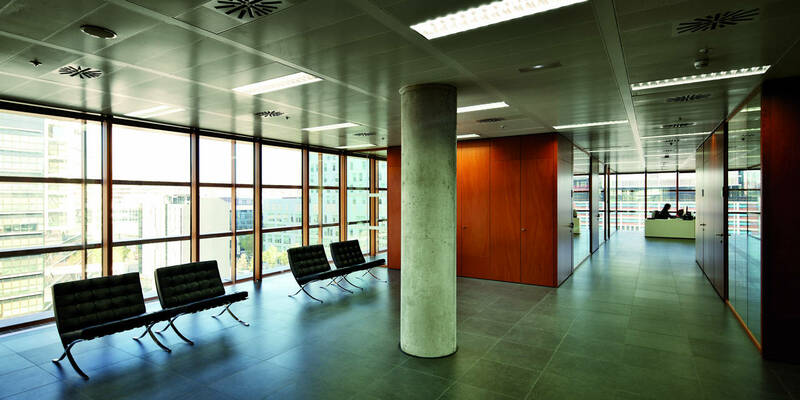 All circulation areas are naturally lit to allow the landings to become places where people can meet one another. 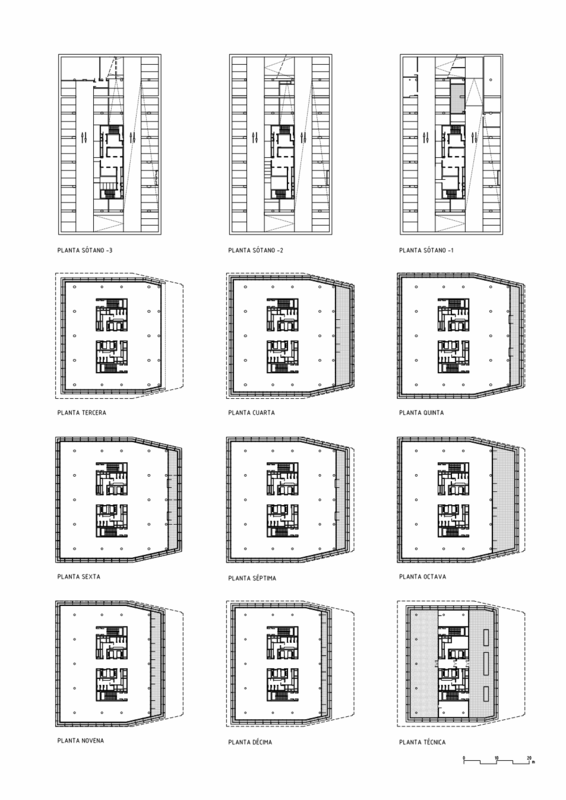 The housing units The design of the general layout was guided by a desire to provide bright sunlit units that are easy to live in and completely adaptable to the personal tastes of each occupant. 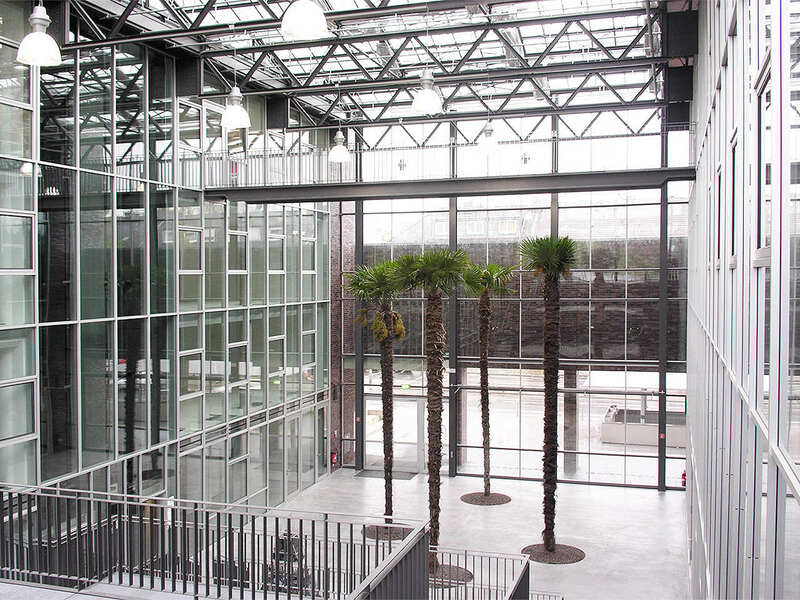 The view over the courtyard will provide the peaceful environment needed for concentration and studying. 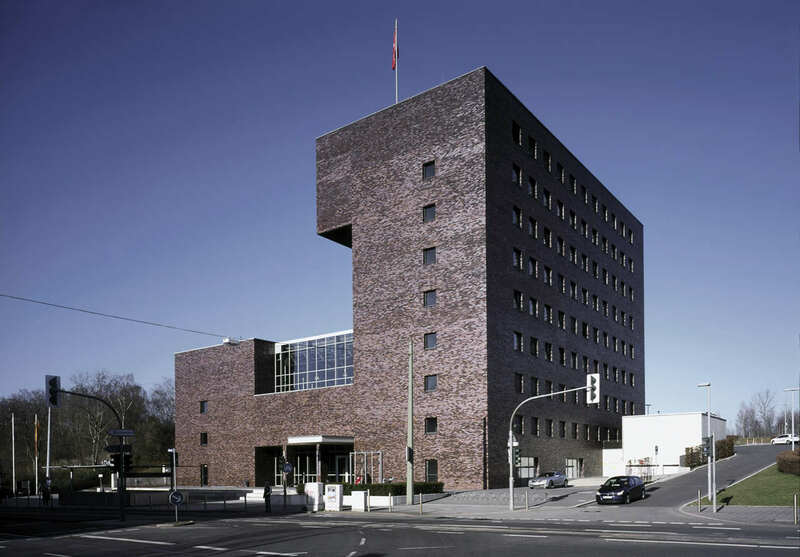 Like the INTERFACE building, the building for the Telecommunications Market Commission (CMT) is situated in the 22@ district. 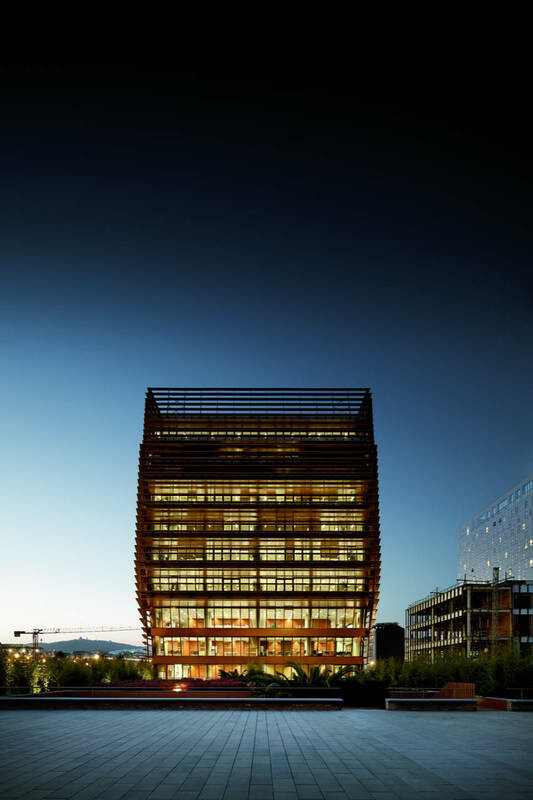 In this case, the building forms part of a complex, 22@ Business Park, developed by Grupo Castellví and containing a large business complex of over 41,000 m2 of offices and hotels, delimited by four streets: Bolivia, Ciutat de Granada, Sancho d’Àvila and Badajoz. 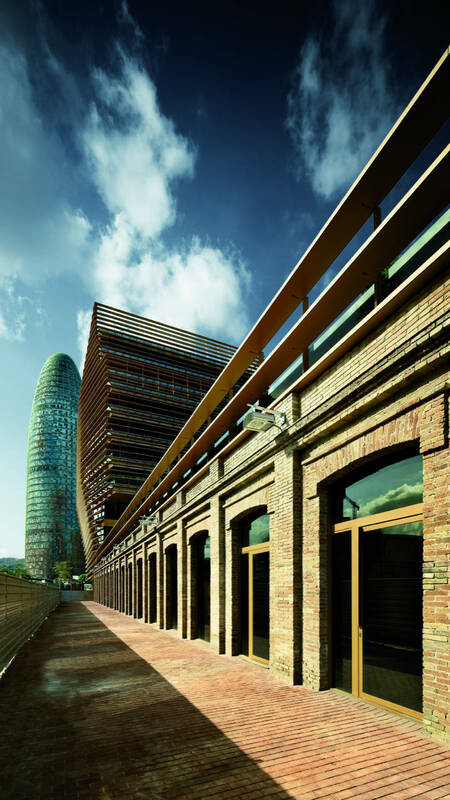 Also set in this sector is one of the factories of the old Can Tiana textile mill, built in 1906 to a project by Guiteras and listed in the Special Protection Plan for the Industrial Heritage of Poblenou. 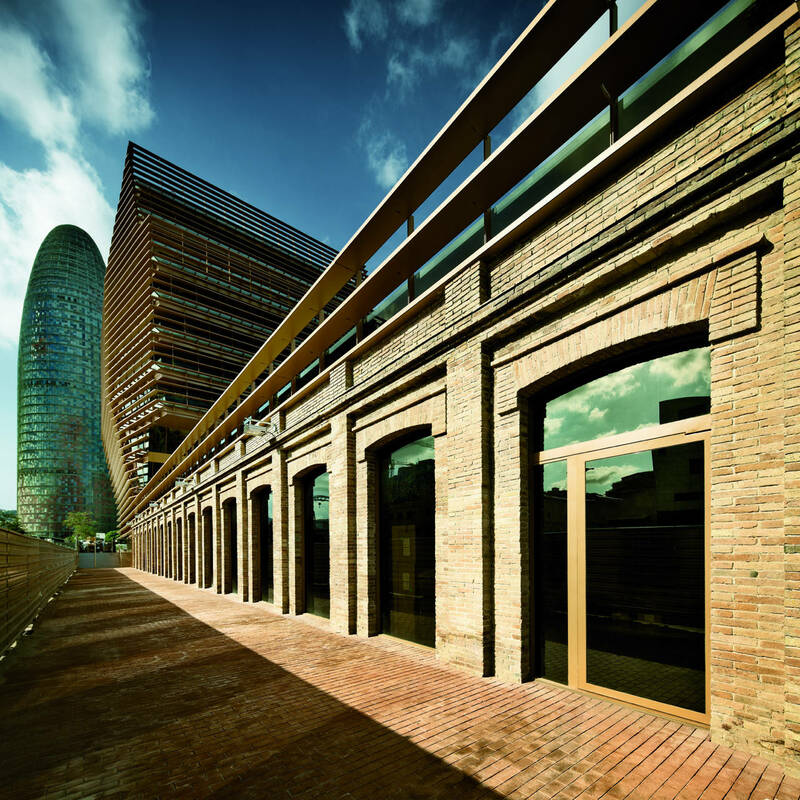 The CMT building stands on a long, narrow site that presents its main façade to Carrer Bolivia and is delimited to either side by a passage. 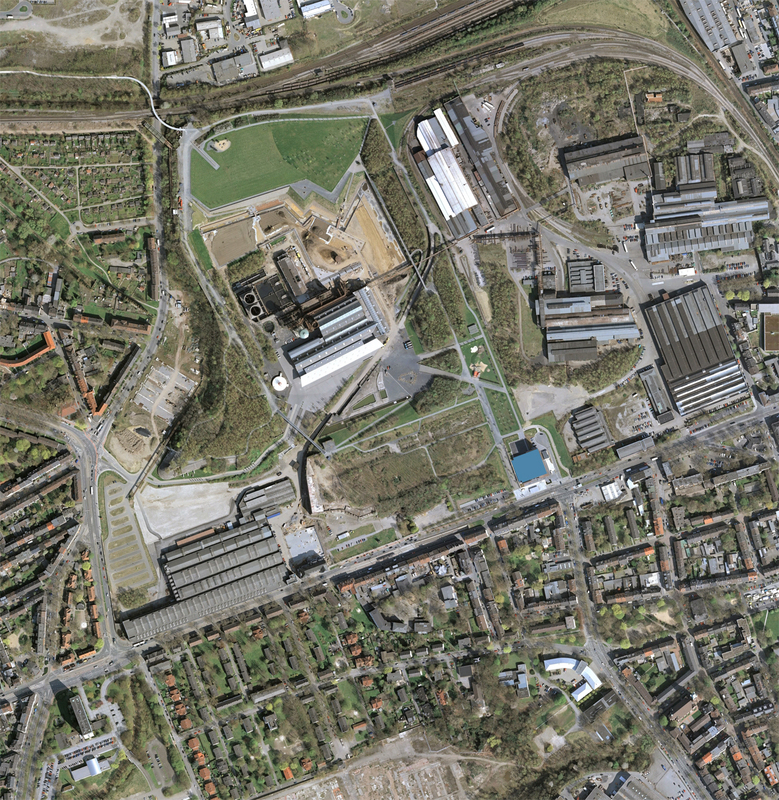 One of the old Can Tiana factory buildings stands at the centre of the site, and the project sets out to recover and incorporate it into the CMT’s functional programme. 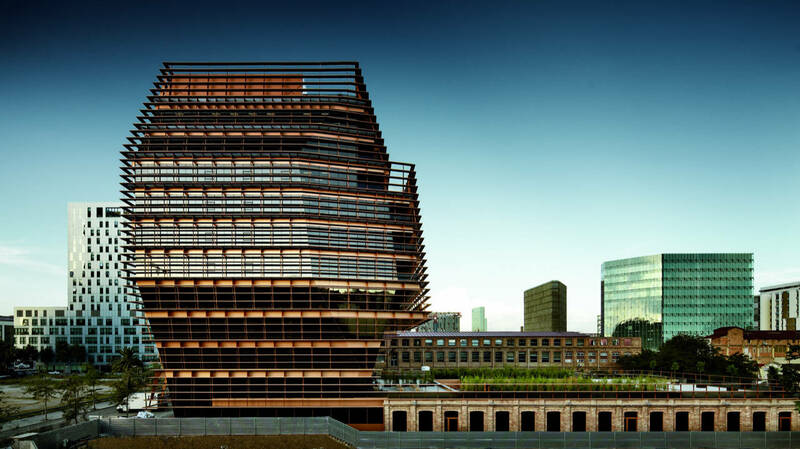 The main volume comprises three basement floors for car parking and eleven floors above grade with offices and services. 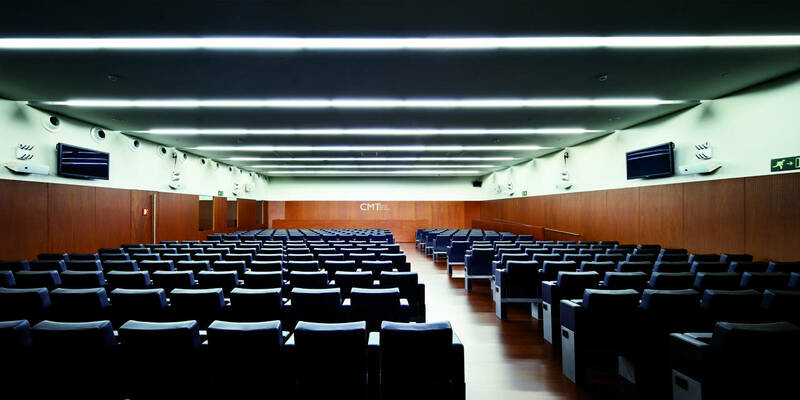 The ground floor, providing the function of access and entrance, connects with the old mill building, the original structure of which is conserved as an auditorium with capacity for 330 persons, a large meeting room and services for CMT employees. The roof of the mill was adapted for use and connects with the first floor. 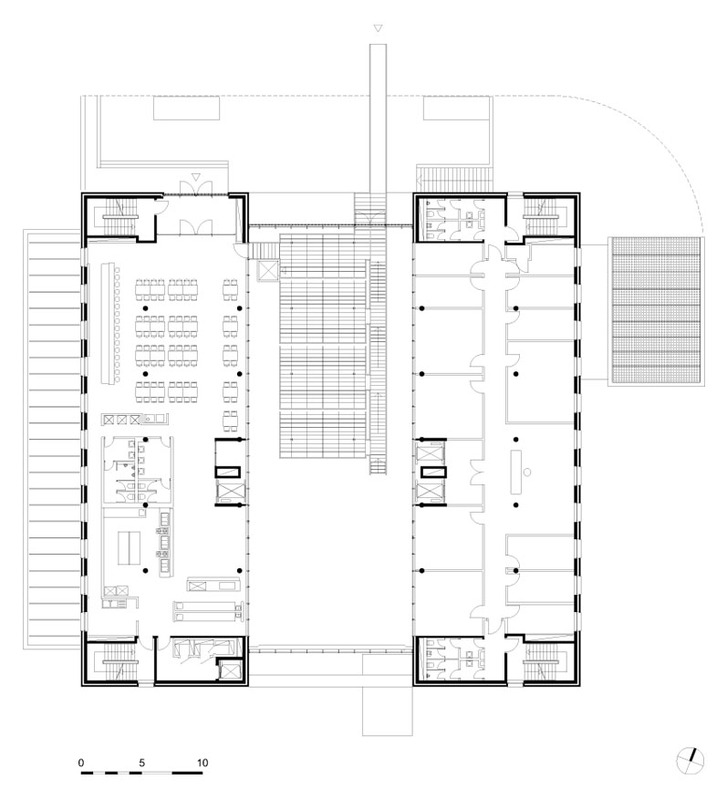 The main volume, containing the offices, is organized around a central nucleus of entrances and services, and the workstations are laid out around it, making full use of the spatial freedom enjoyed by a building that opens out on all four sides. 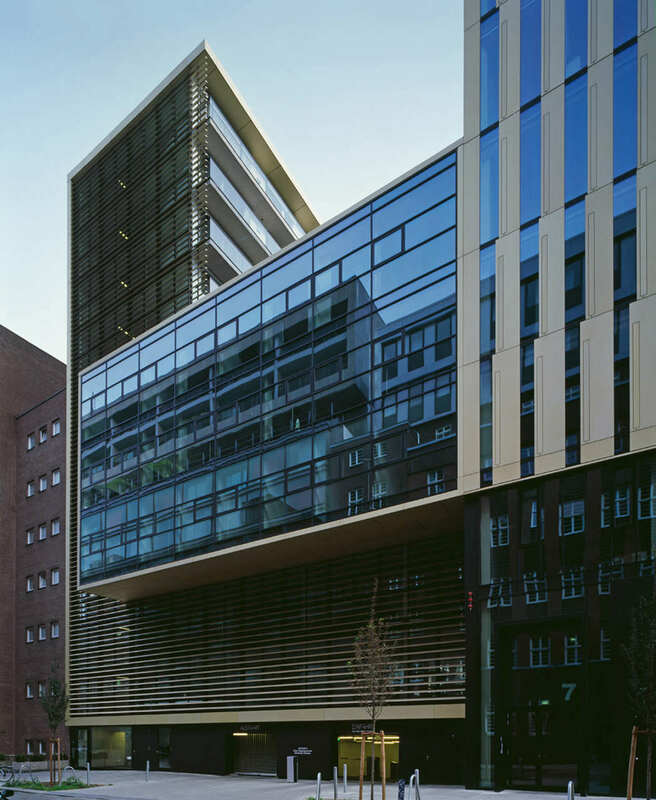 This allowed us to explore a volumetric formalization that sets the building apart from its surroundings, highlighting its lengthwise asymmetry and increasing its height in relation to the axis of the street. 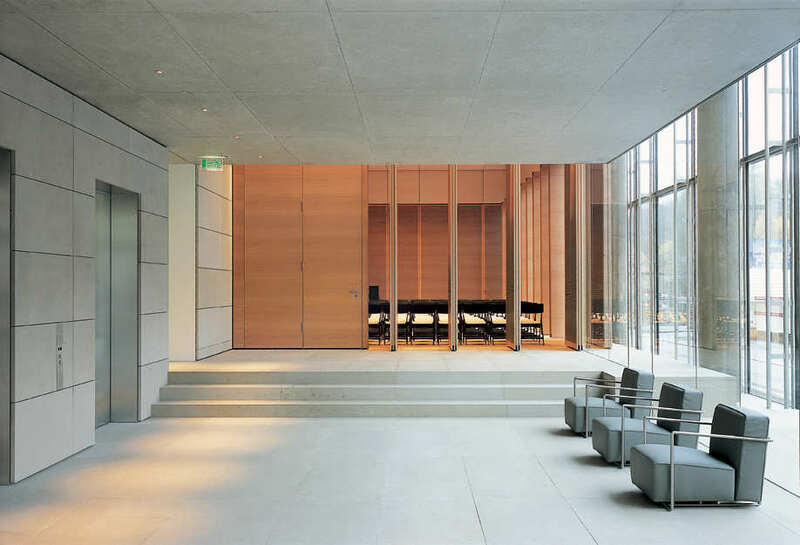 This formal freedom produces a singular form, faceting the faces of the building and moulding it as a unique, recognisable piece that finds its reason for being in an innovative relation between exterior and interior. 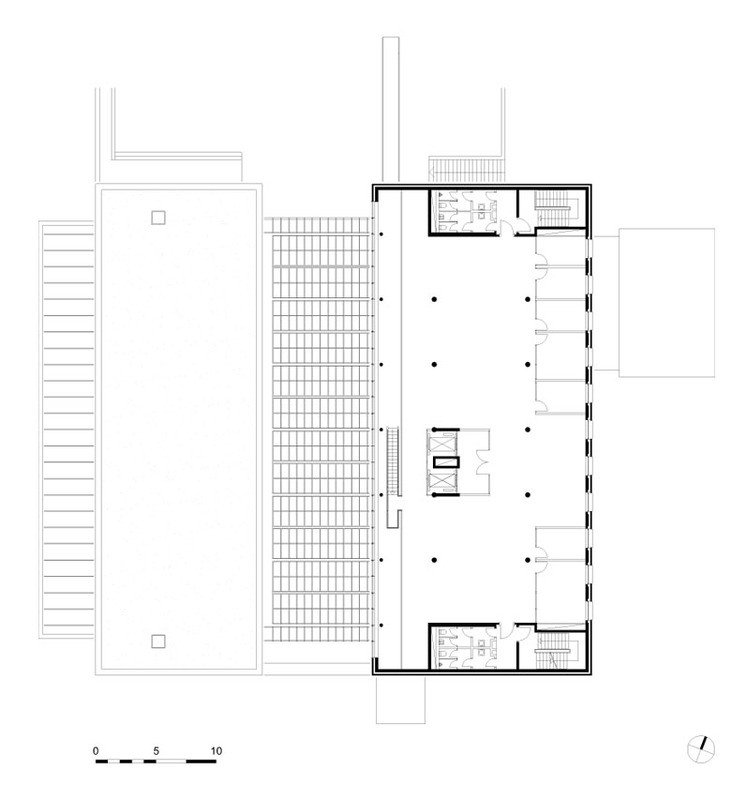 The variation and superposition of exterior spaces and workspaces serve to direct the volume towards the old factory and establish a subtle, utilitarian relation. The distant presence of the sea and a south-facing orientation determine the correct position of the terraces. 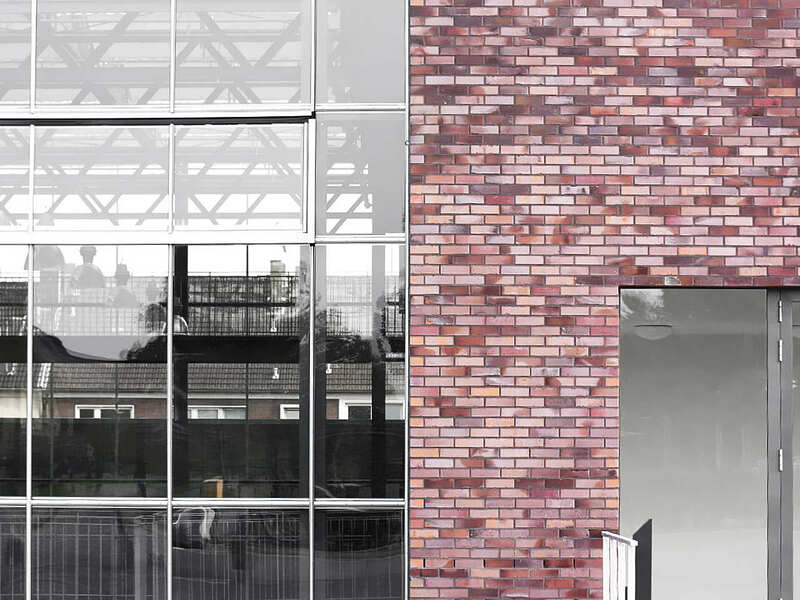 The decision to bring a unitary treatment to the building’s outer appearance led us to protect its façade using a horizontal slat system throughout its volume that continues over the old factory, connecting the two. 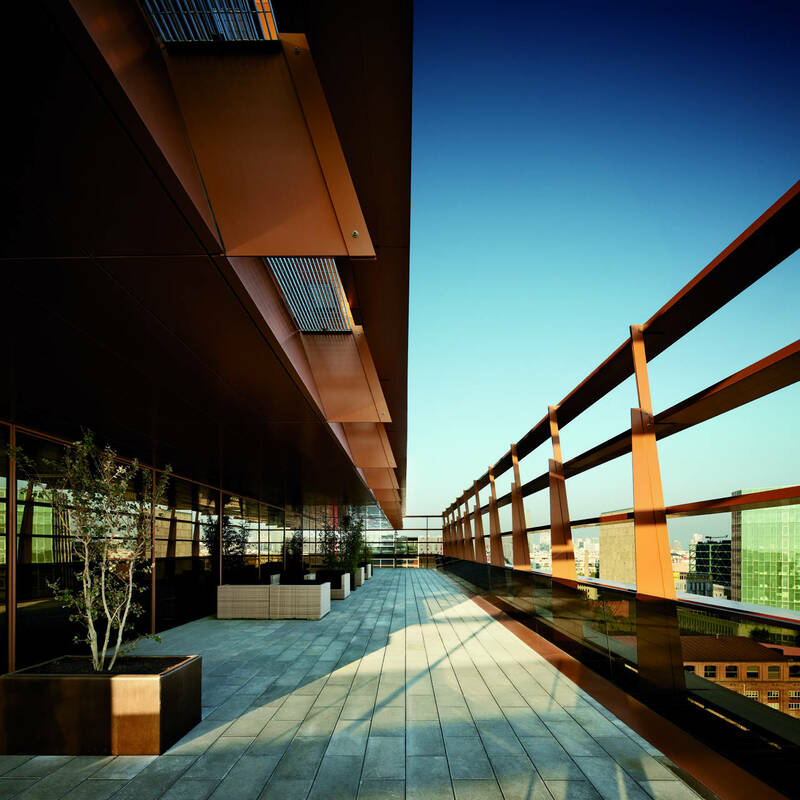 The slats serve to cover the upper terraces and installations, and form an awning at the ground floor entrance. 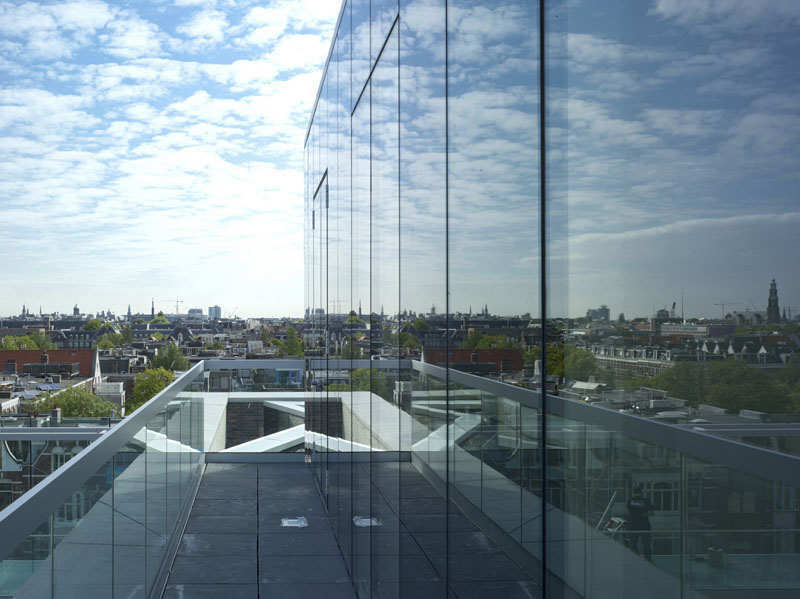 Tony Fretton Architects has completed a new seven-storey 8000 sqm building in central Amsterdam. 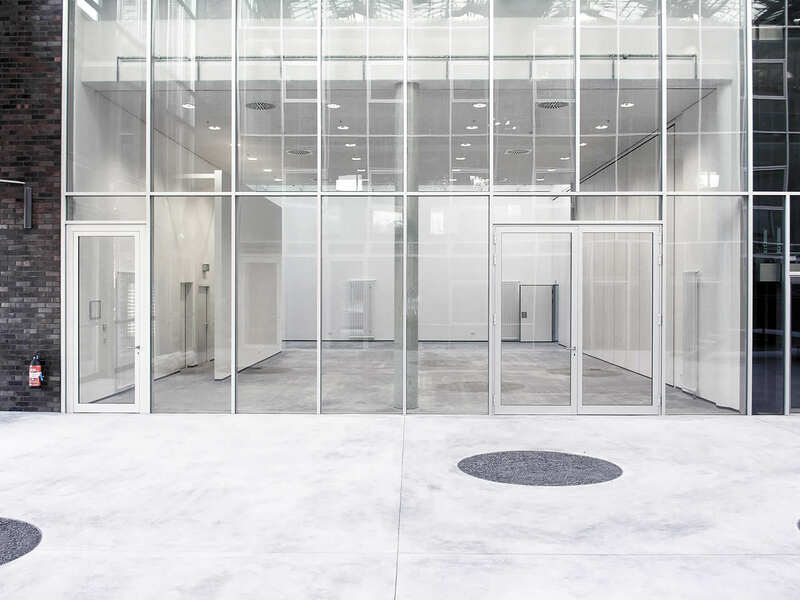 The project is the fourth building completed by the practice in the Netherlands, the country in which founding director Tony Fretton has held a professorship since 1999, as Chair of Architectural Design & Interiors at Technical University of Delft. 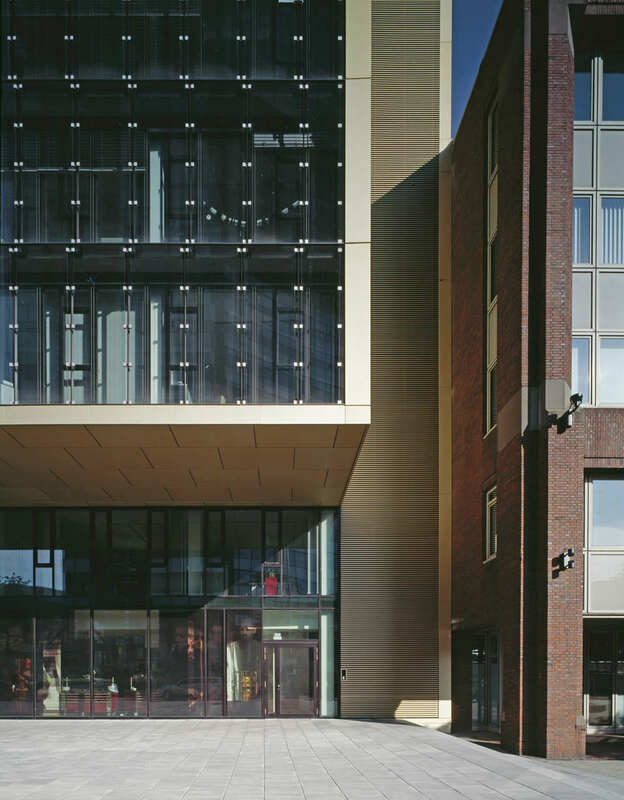 Located near the Vondelpark, Solid 11 is one of three new-build projects designed by Tony Fretton Architects on inner city sites released by the relocation of hospitals and industry, the others being Andreas Ensemble in Amsterdam West and de Prinsendam Overhoeks. 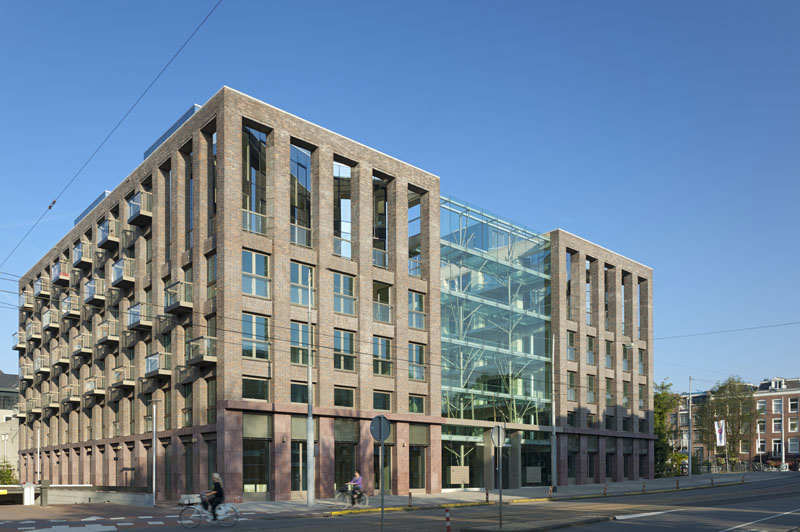 Commissioned by Dutch housing association Stadgenoot, the building is an example of a “solid”, a new highly durable and sustainable typology devised by Stadgenoot which is presented to the market as a constructed shell, offering flexibility to the building’s tenants to decide on the size, configuration and use of space. 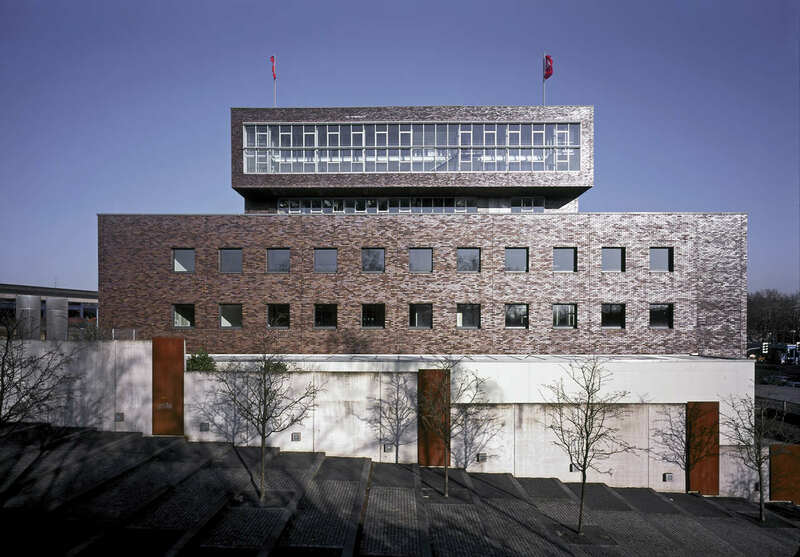 The building is one of three in a masterplan devised by the late Belgian architect Jo Crepain. 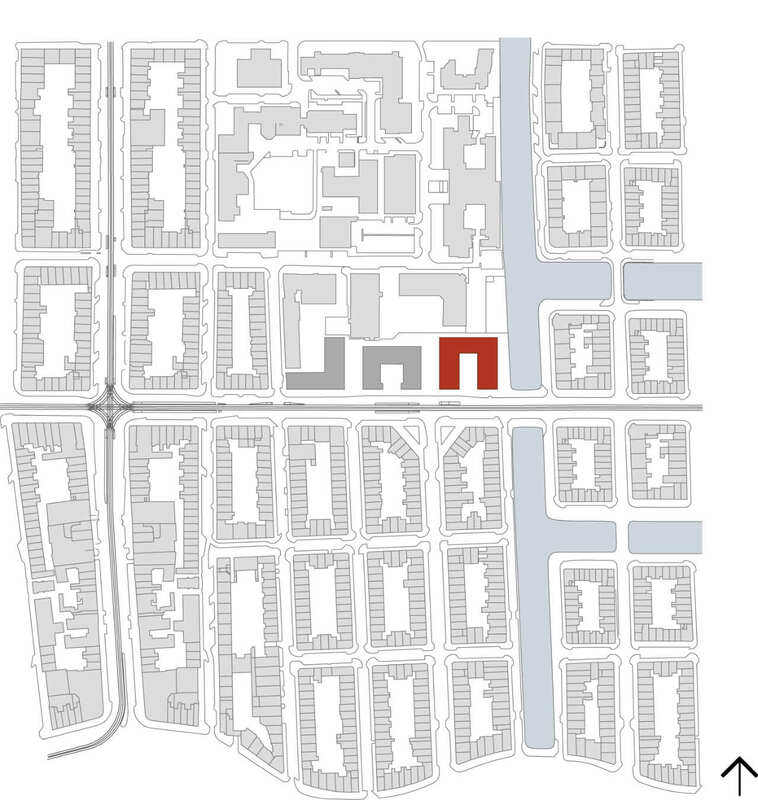 The masterplan organises the buildings in sequence along Constantijn Huygenstraat separated by public spaces. 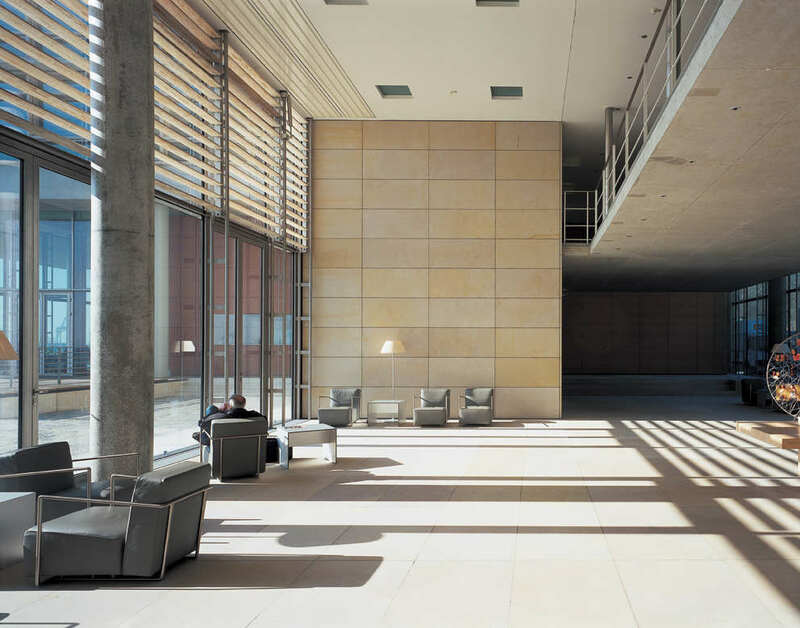 Each building is similar in form and alignment and configured as a pair of parallel blocks with a private open space between them. 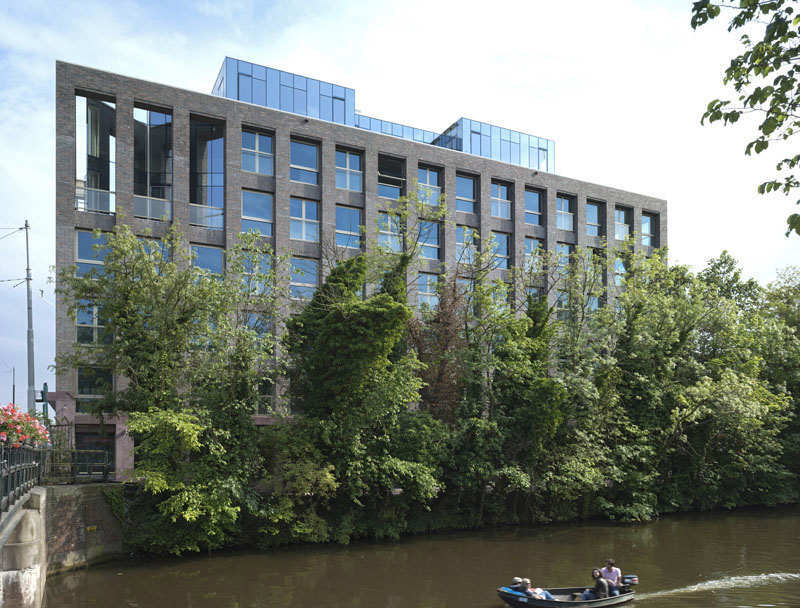 Solid 11 is the third building in the sequence and is sited next to Jacob van Lennep canal. 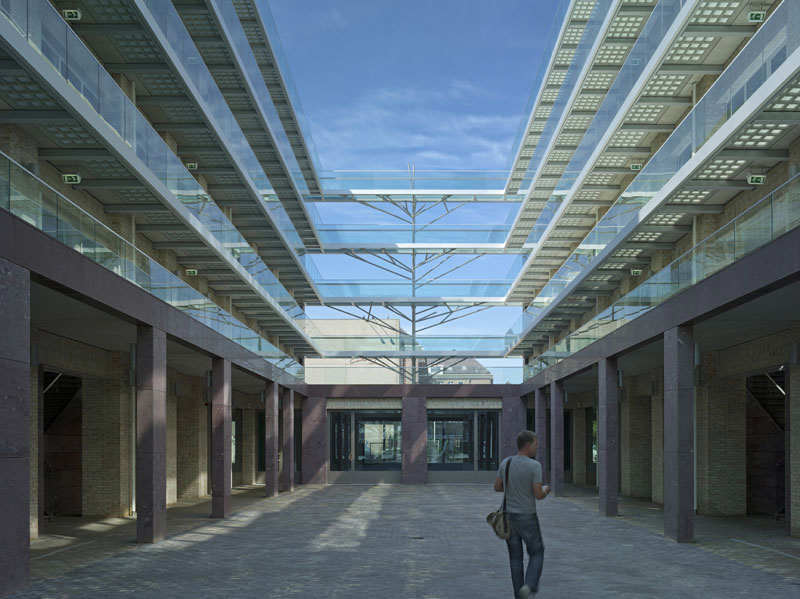 Unlike the other two buildings, the design of which has been tailored to a specific purpose as social housing and a psychiatric hospital, Solid 11 has been designed to provide flexible space for a range of activities including apartments, workspaces, a hotel, shops, cafes and restaurants and public facilities such as a kindergarten. 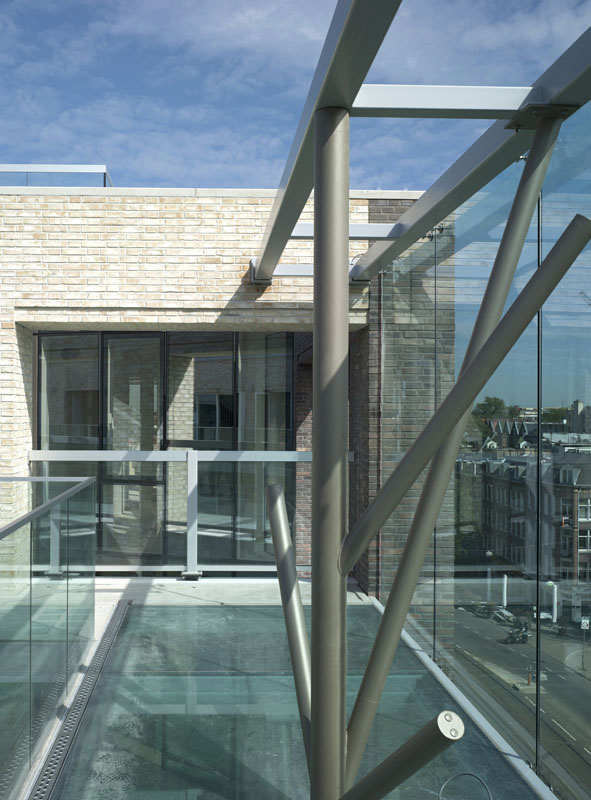 As in the Red House, a private town house in Chelsea completed by the practice in 2001, spaces are architecturally powerful yet non-specific, inviting a variety of uses. 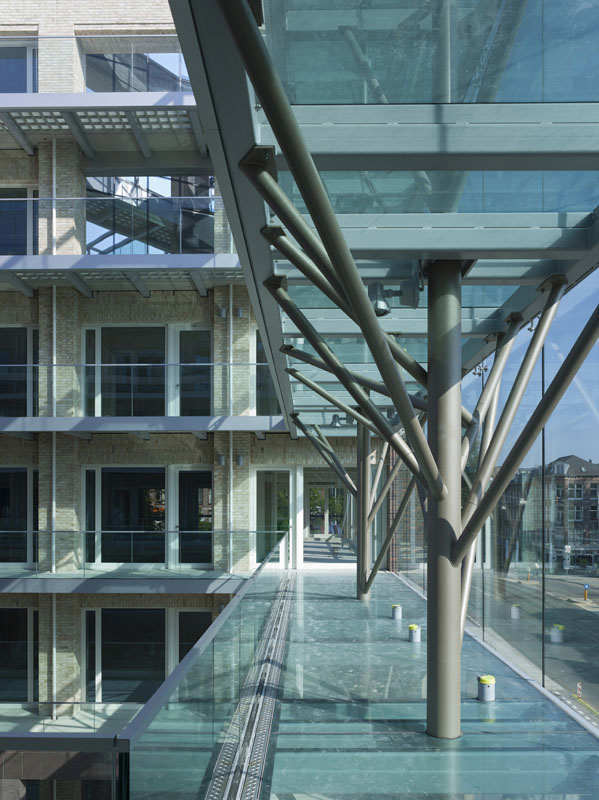 The client Stadgenoot required the main elements of the building to have a 200-year life span. 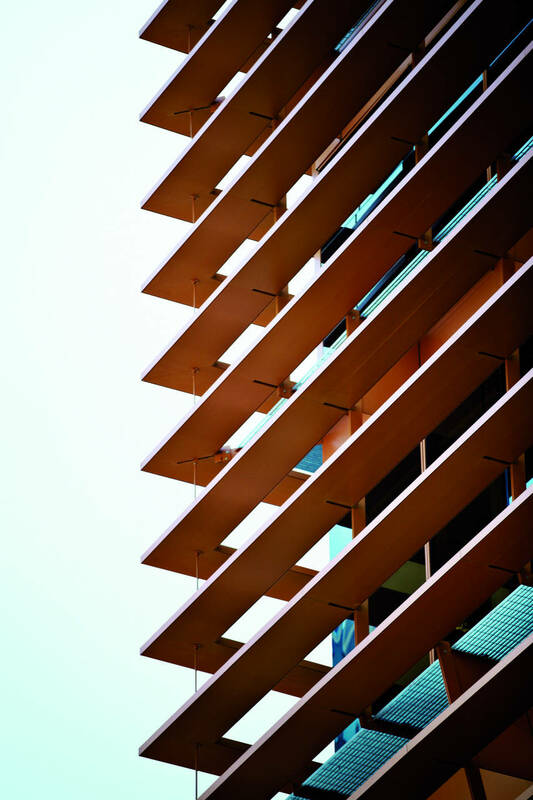 The facade has been designed as self-supporting. 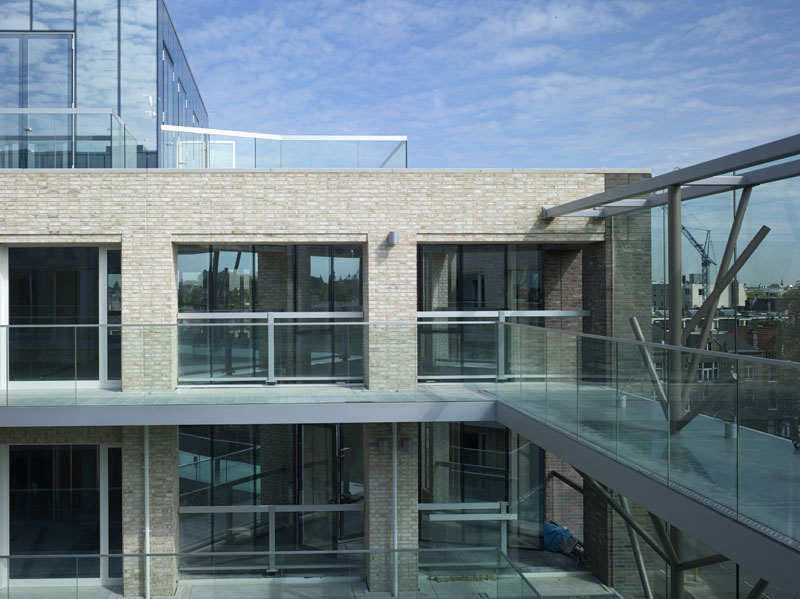 The brickwork piers are built off the basement walls and are fixed to the concrete frame with stainless steel ties. 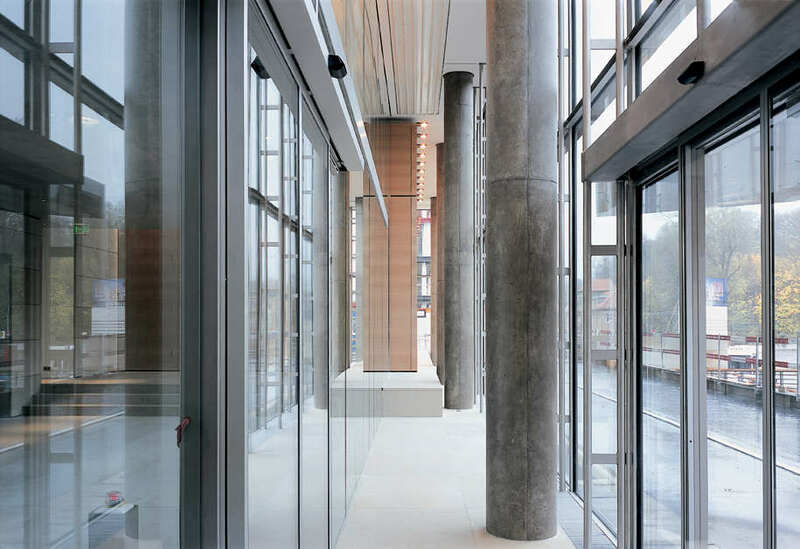 The horizontal spandrels are precast concrete, faced with the same brick, and are built into the piers. 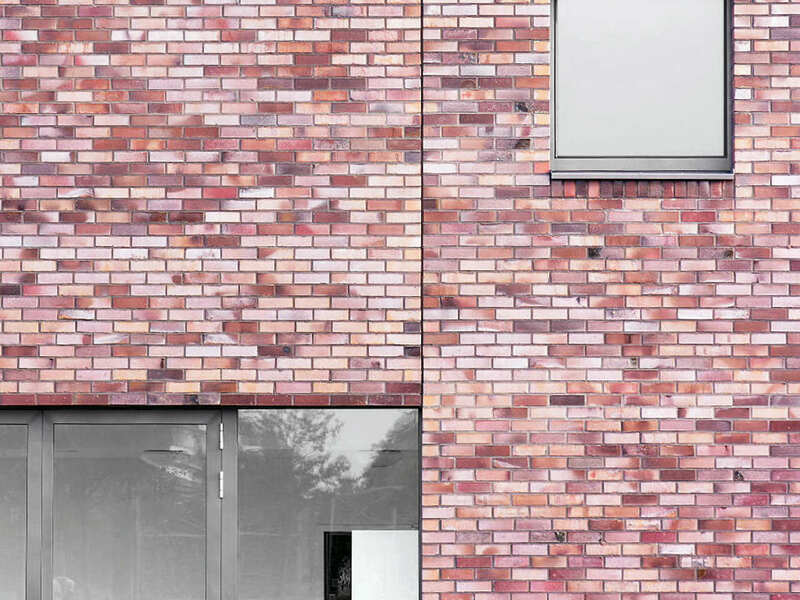 The bricks used are charcoal-fired Petersen bricks, reddish brown on the outer facades and yellowish white in the courtyard. 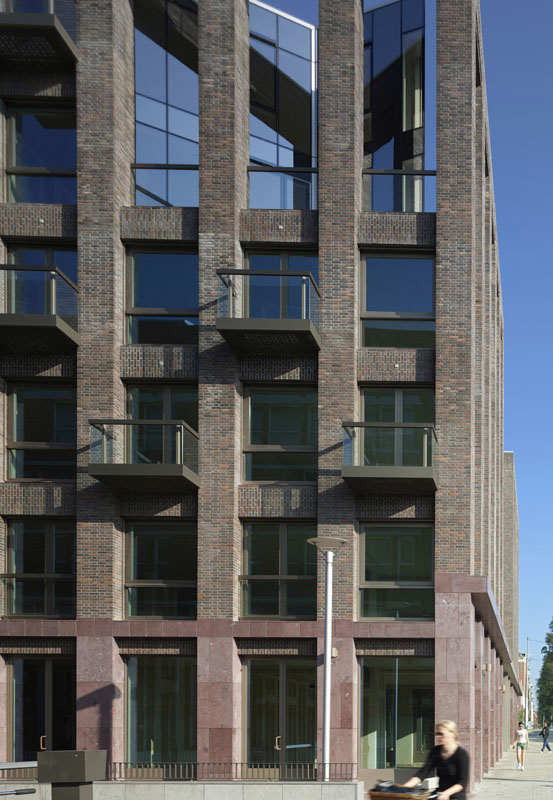 On the ground floor the brick piers are clad with highly durable, red porphyry natural stone. 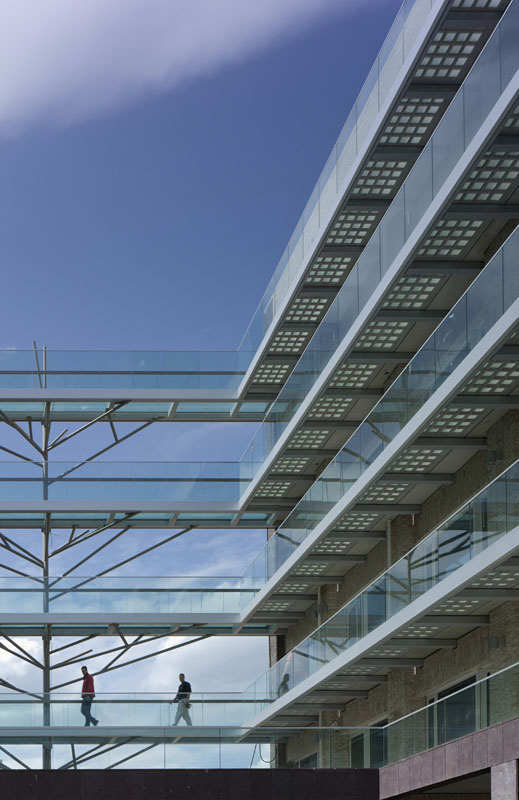 The penthouse pavilions on the roof of the building and the recessed star-shaped elements on the 4th and 5th floors of the building’s front façade feature highly reflective structural glass curtain walls. 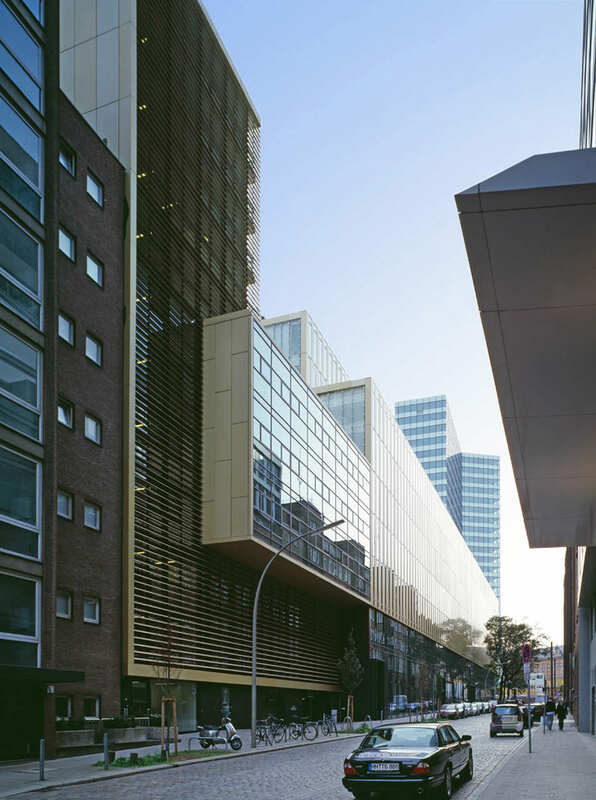 A key element of the design of the building is the central courtyard extending from ConstantijnHuygenstraat, which will contain shops, cafes and public facilities overlooked by access balconies on the upper floors. 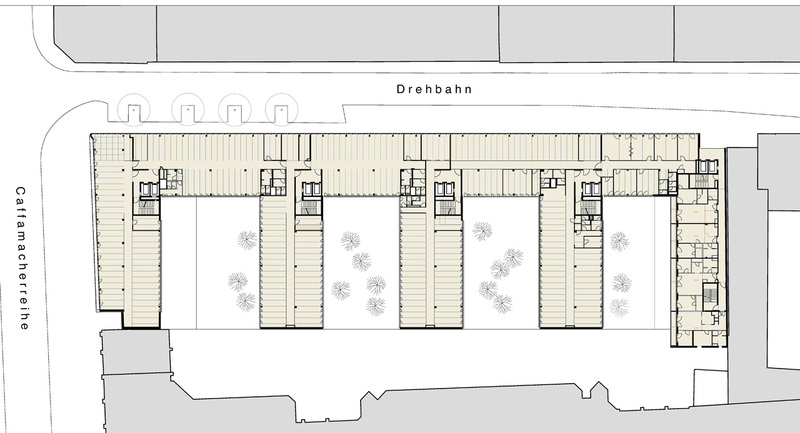 Given the prominent position of the building next to the canal, it is intended that the courtyard will become a local public place and a neighbourhood in itself. 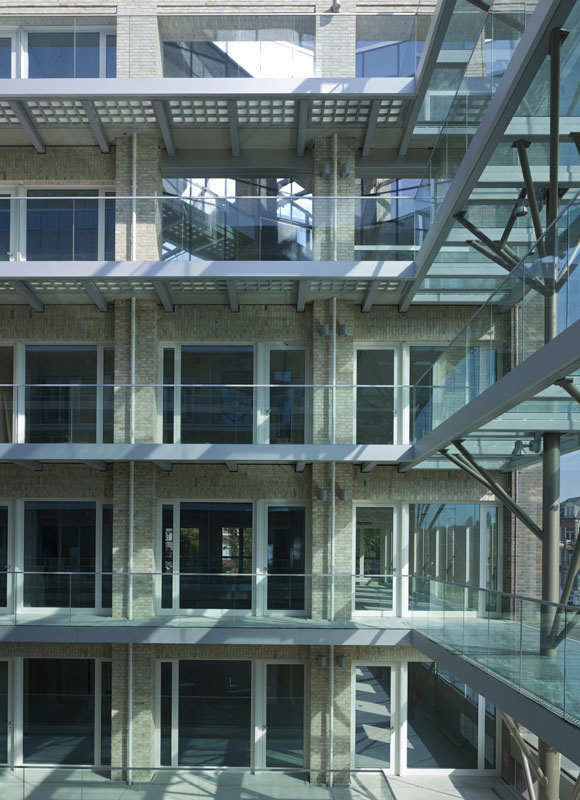 The courtyard is protected from traffic noise on ConstantijnHuygenstraat by a 6-storey high glass acoustic screen. 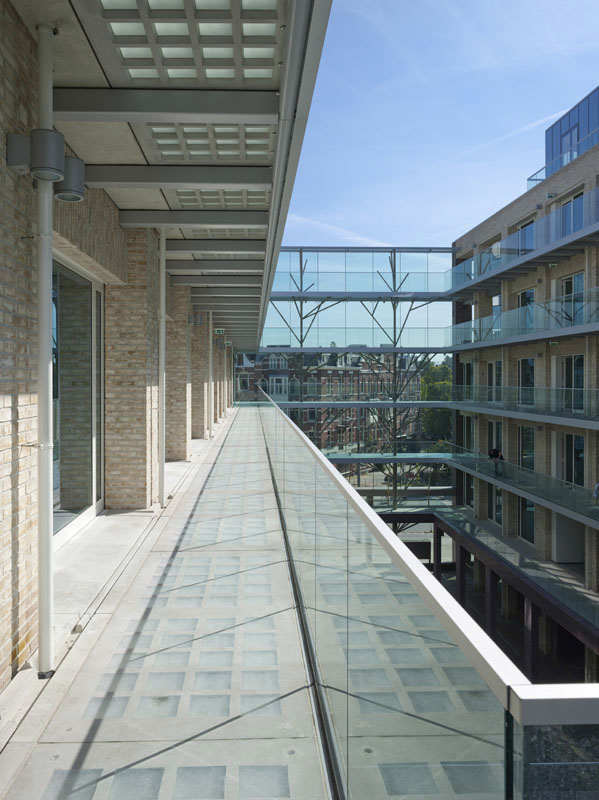 Behind this screen glass bridges supported by abstract steel trees connect the pre-cast concrete access balconies on the opposite sides of the courtyard. 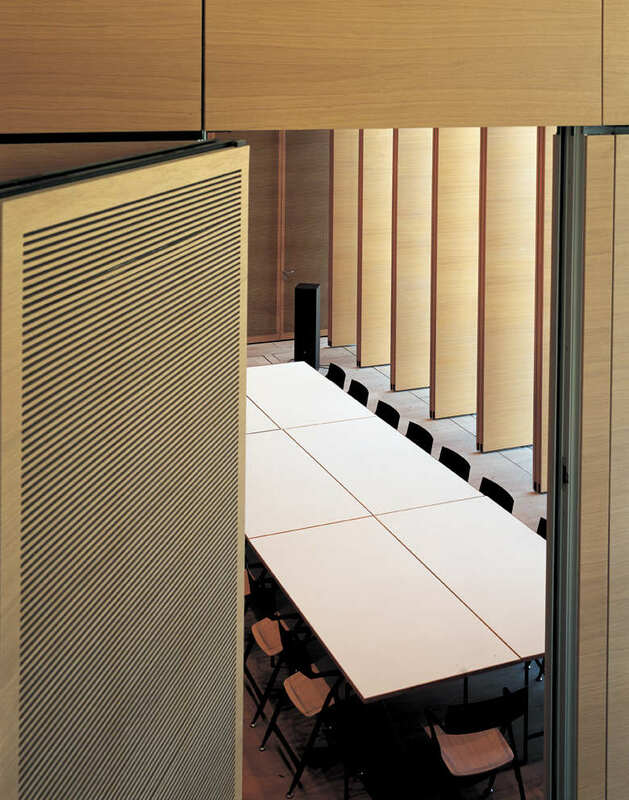 The doors are tall bronze powder-coated steel doors on the ground floor and bronze anodized or white powder-coated aluminium doors on the floors above. 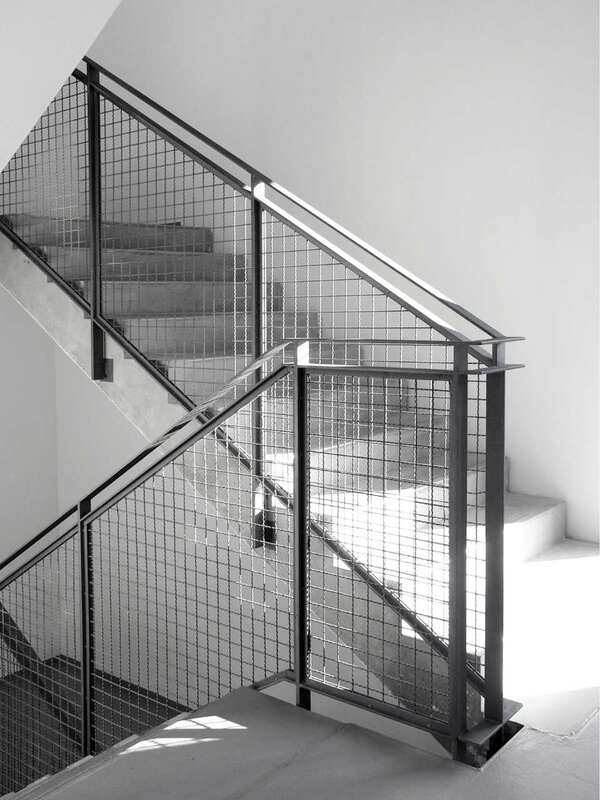 The stairs of the building are generous porphyry-clad stairs on the ground floor and pre-cast terrazzo on the floors above. 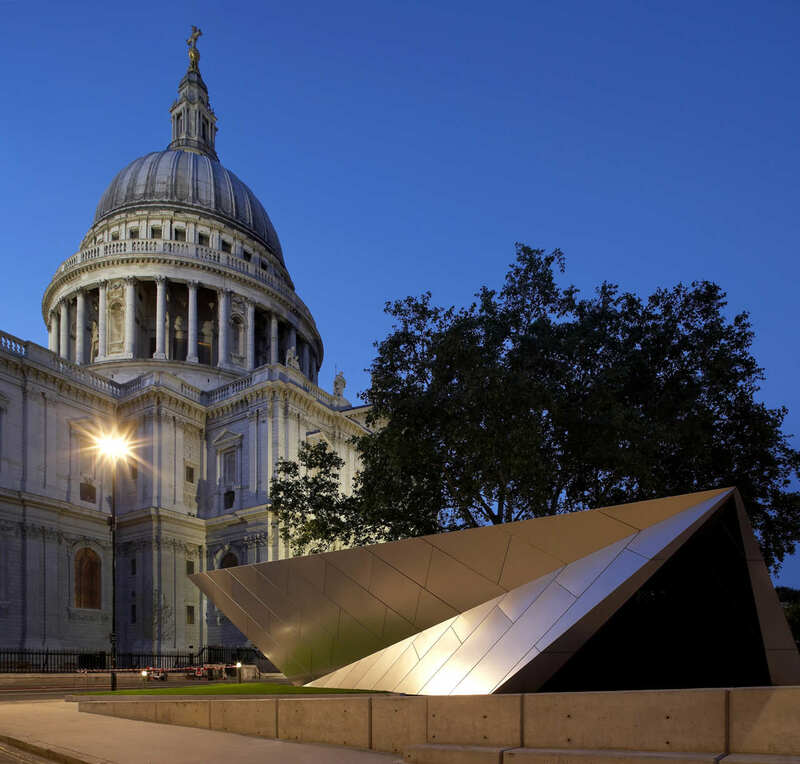 In the architecture there is a play between the abstract building form, the expressiveness of its materials of dark brick and porphyry and metal tree forms, and recognisable elements from other architecture that are freely transformed. Michaela Bluhm, Michael Gutena, Hannes Beinhoff. 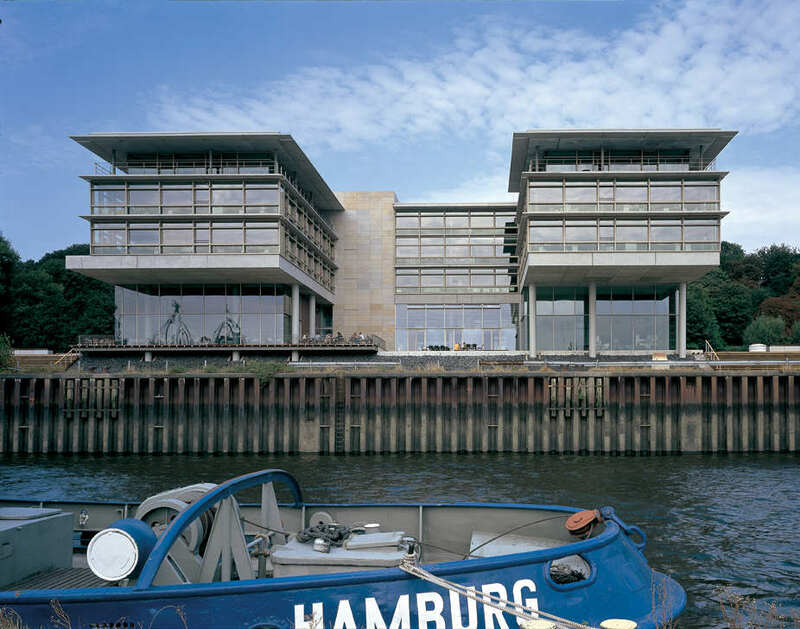 The strong unity of the surrounding perimeter blocks in the city of Hamburg as well as the dominating existing Unileverhaus frame the combined office and residential development with strong urban and architectural presence. 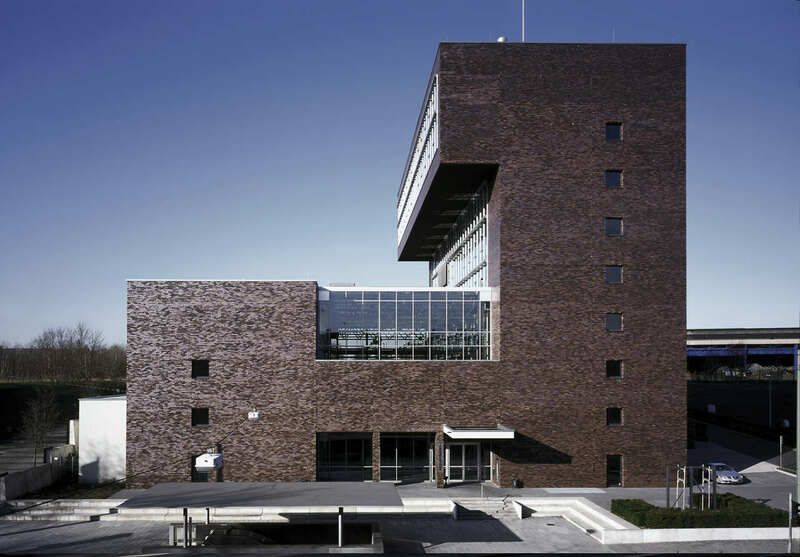 The design embraces these contradicting conditions by using a calm figure developed out of the perimeter block structure for the office building. 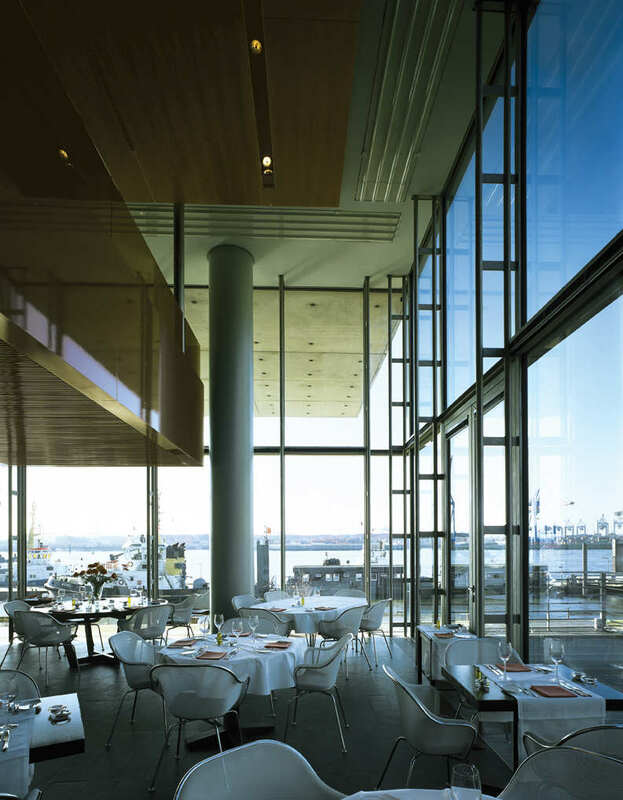 The radically minimalist and modern architecture exposes its urban face to the Caffamacherreihe. 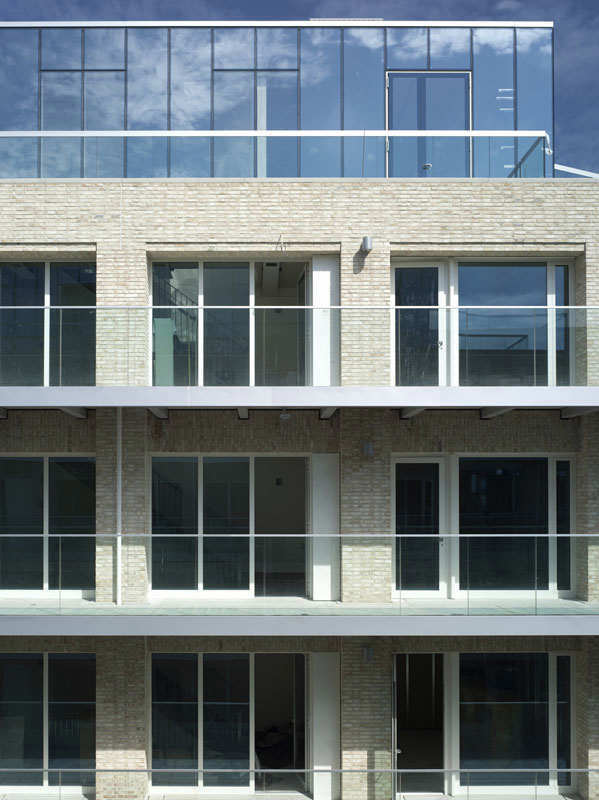 An elongated elegant overhanging part of the structure appears in a sectional profile as part of a frameless glazing double facade. 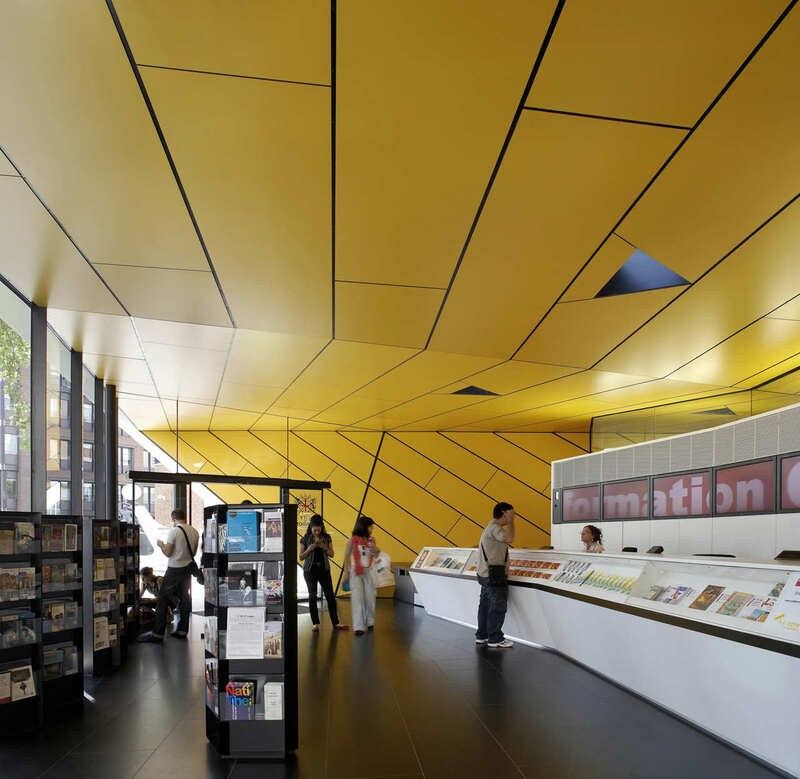 Around this glass section wraps a band of anodized aluminiumsheets in brass. 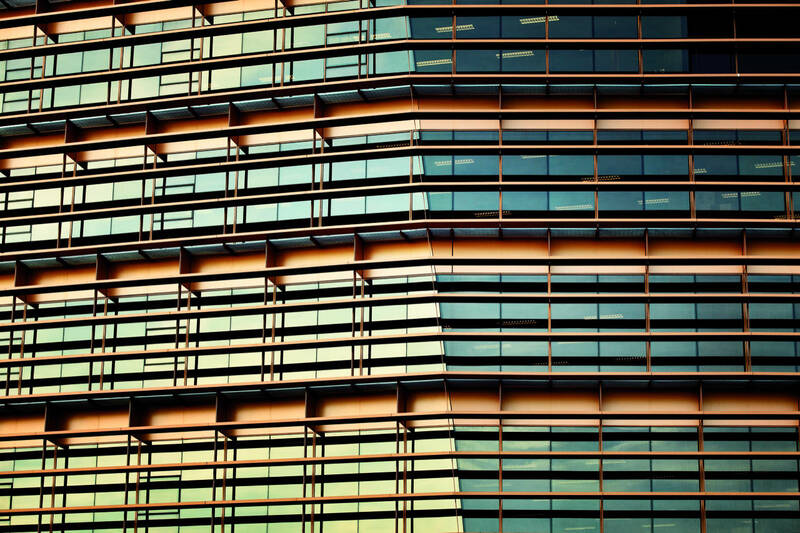 The facade is divided in story high, vertical strips of glass and closed panels with integrated blades. 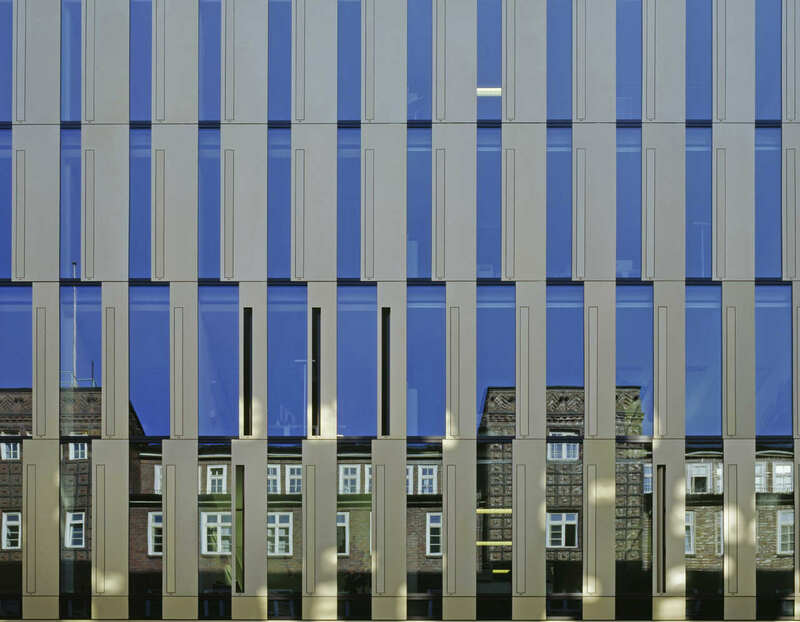 By minimally varying the width of each panel a surprising dynamic and irritation in the percipience of the absolute plane and elegant façade is created. 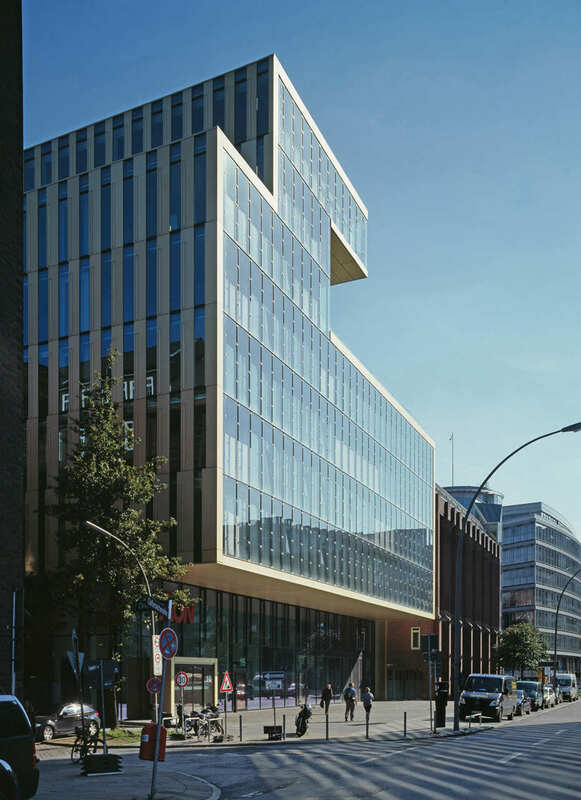 The residential building steps in between the existing Deutschlandhaus and the new office building CR 16, as a strong sculpture. 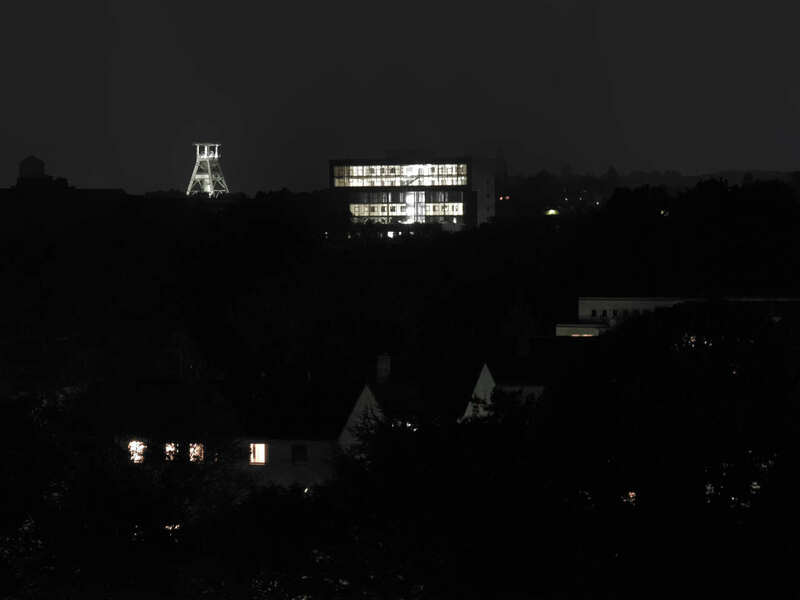 The IG Metall [Metalworkers’ Trade Union] JAHRHUNDERTHAUS headquarters lies very close to Bochum town centre in the Westpark on Alleestrasse. 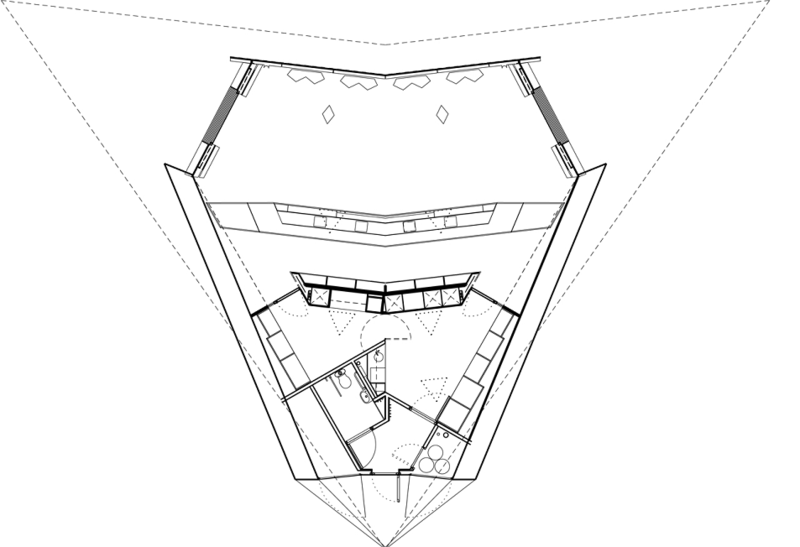 The draft envisages two parallel blocks running north – south, connected by a transparent hall. 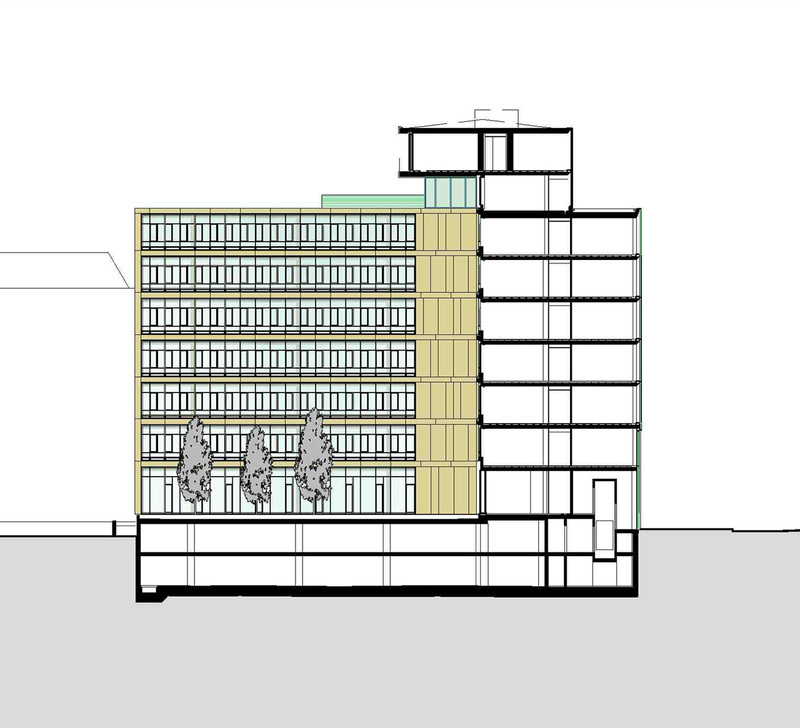 The east wing contains 9 storeys and on the west side the top two floors project outwards by approximately 4.40 metres. 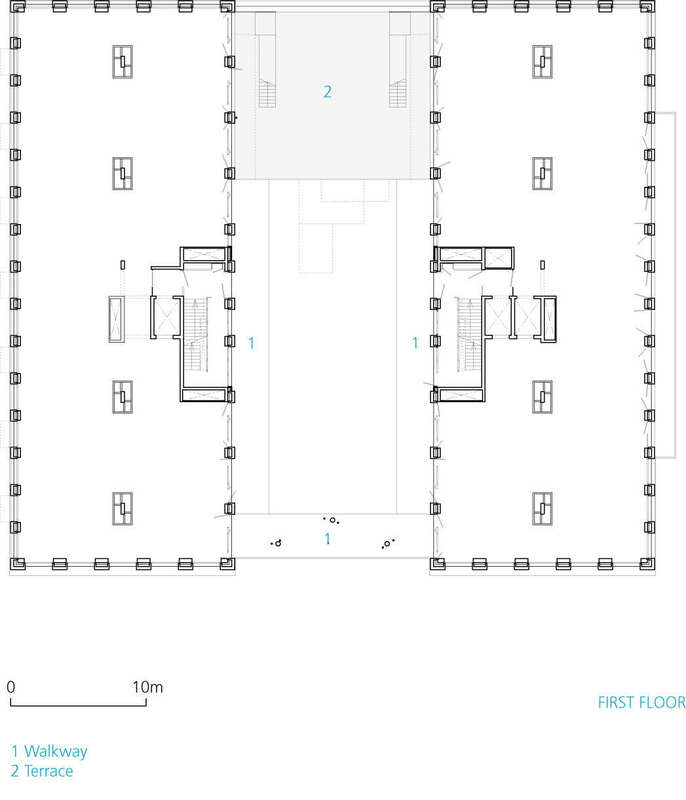 The west wing contains 4 storeys (a 2-storey high assembly room (divisible), the catering area on the 2nd floor, and the seminar area on the 3rd floor). 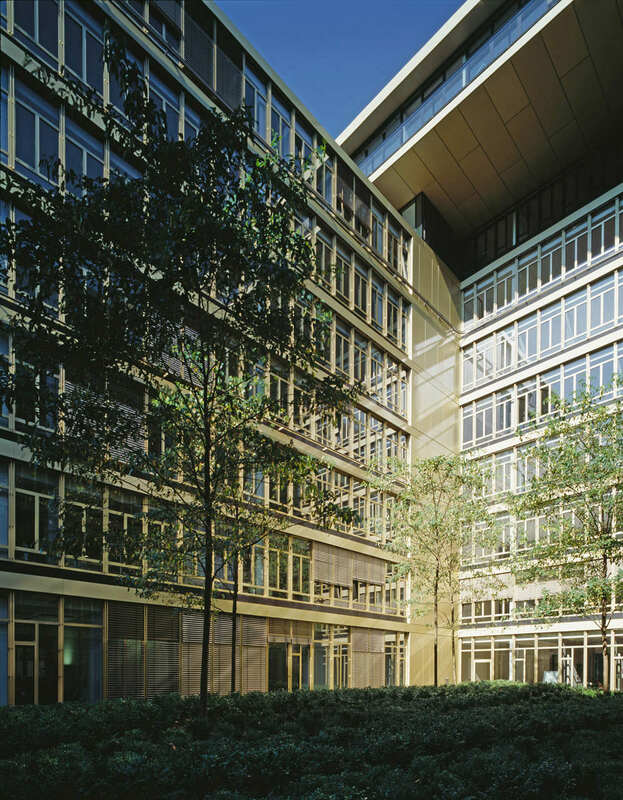 Access to the building is by way of a glass-roofed hall with a path from the Alleestraße (main entrance) via a steel-structured, four-level stairway to the Westpark. The difference in height of the terrain (approx. 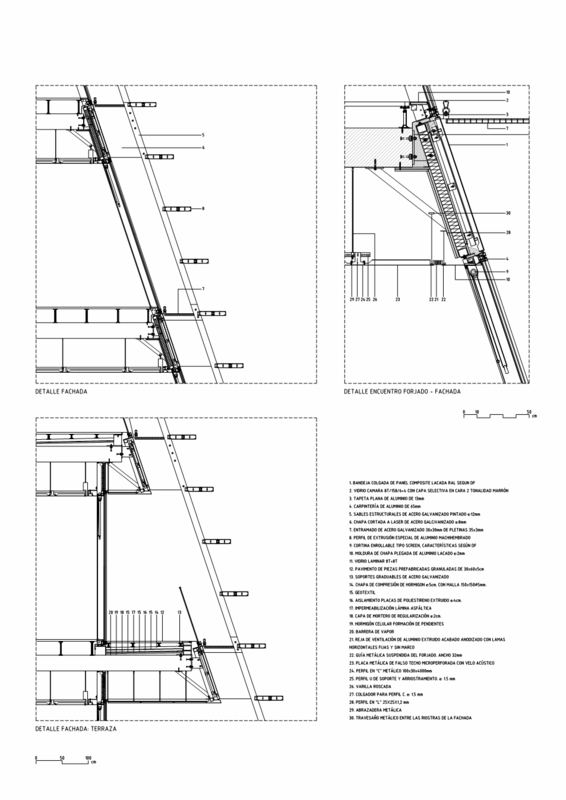 7.00 m) is made both visible and useable in the hall by four stepped, steel platforms. 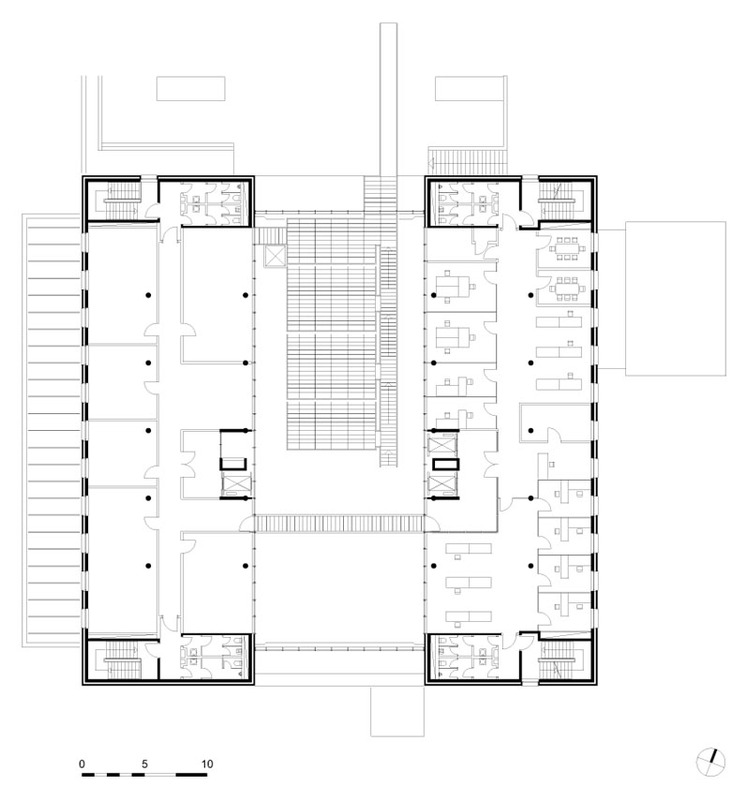 The floor plan enables a number of variable uses to be made due to the combination of restaurant, foyer and assembly rooms. 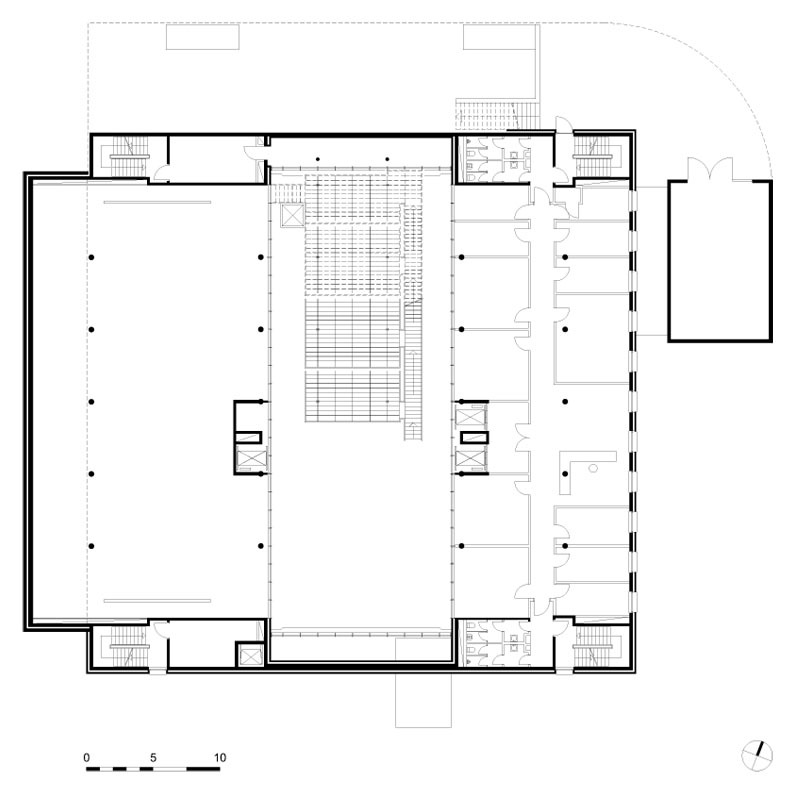 On the ground floor (at Alleestrasse level) connected to the hall there is a divisible assembly room, an Internet venue, and a youth room. 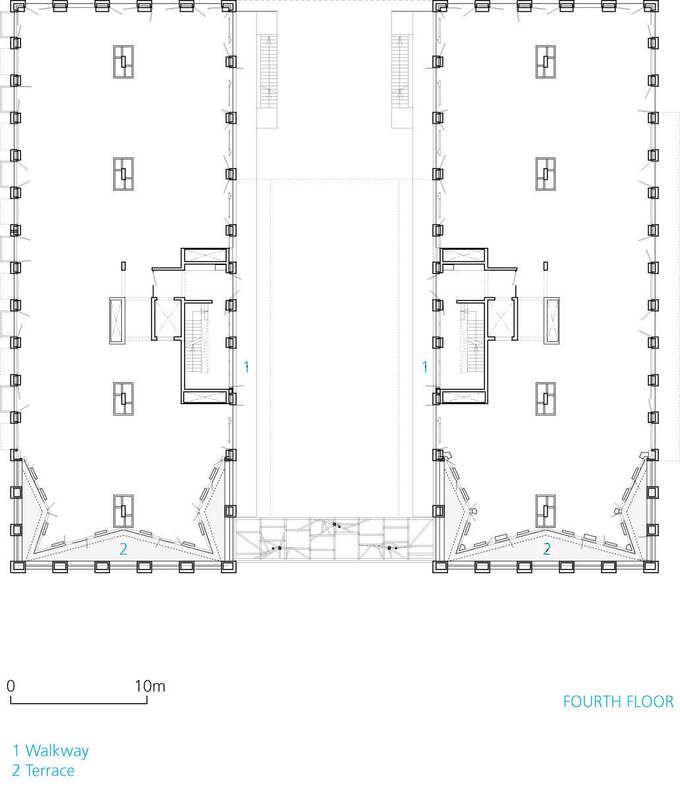 The office areas on the upper floors are accessed via lifts from the hall. 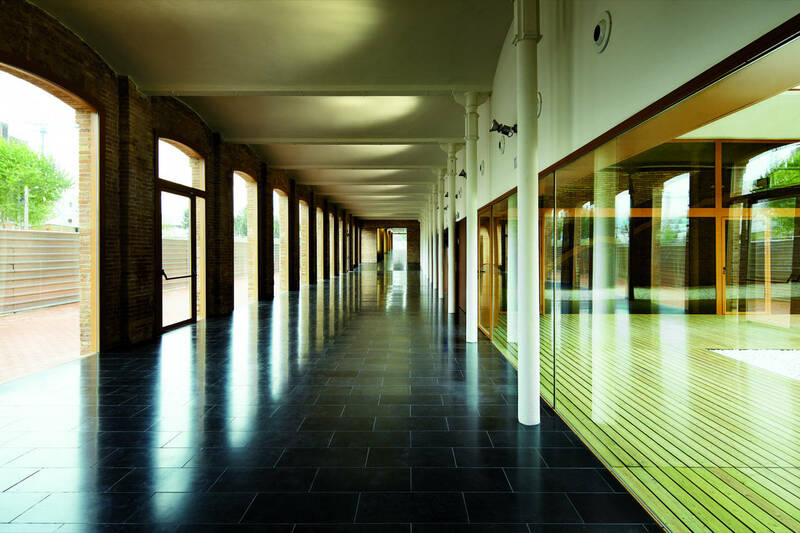 On the 2nd floor (at the level of the Westpark, roughly + 7.00 m), in the west wing there is a catering establishment open to the public. 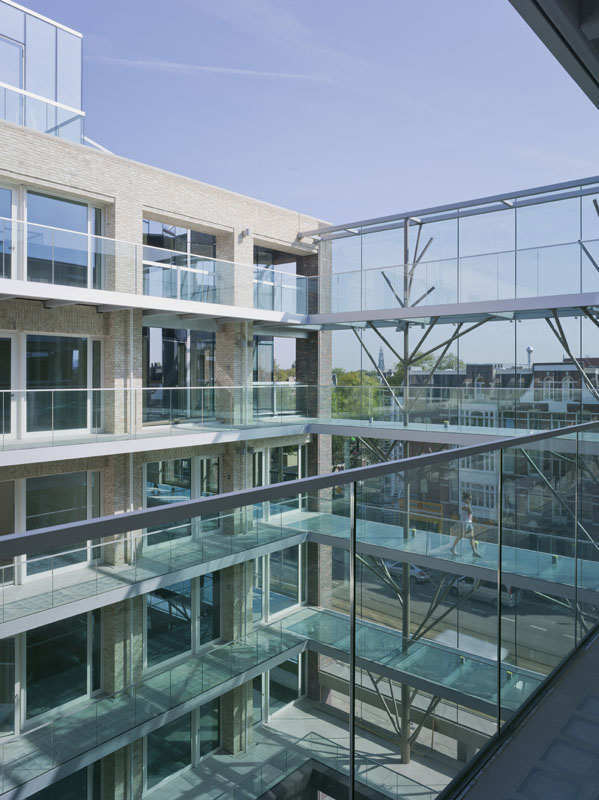 It and its terrace face onto the Westpark and have here an additional, separate entrance. 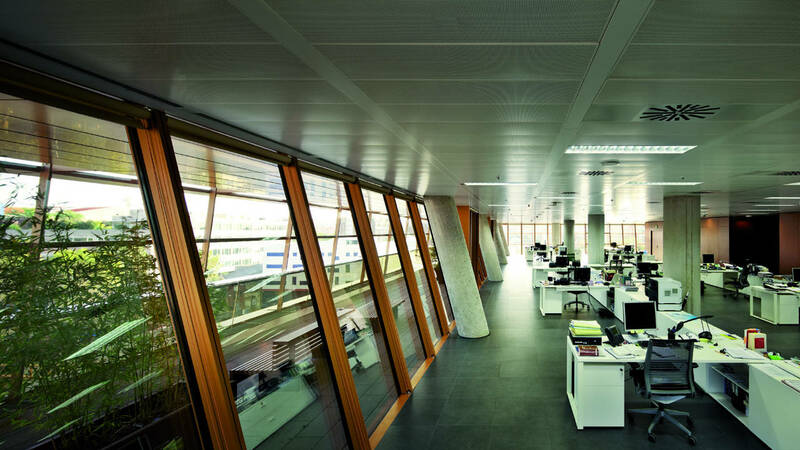 The building is designed with flexible office use in mind and can be laid out as group offices, as a double-loaded corridor with cubicles or also as an open-plan office. 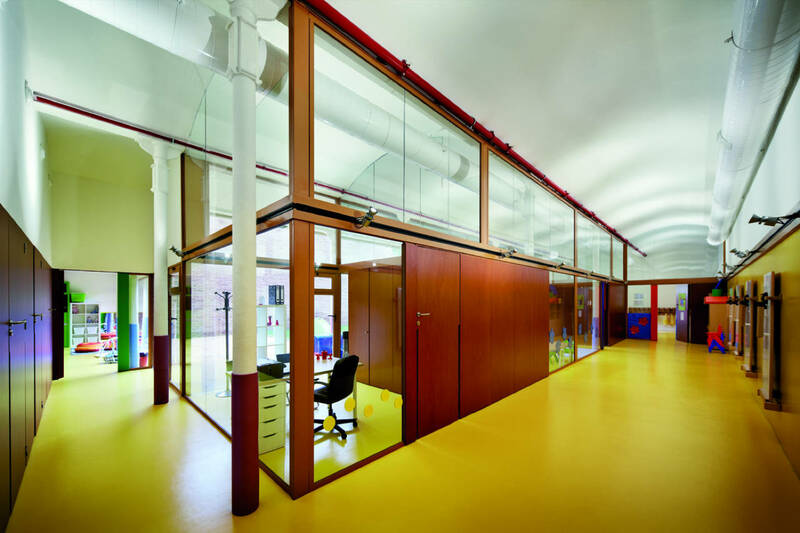 The floors are easily divisible and can be leased flexibly (3.00 metre room height). 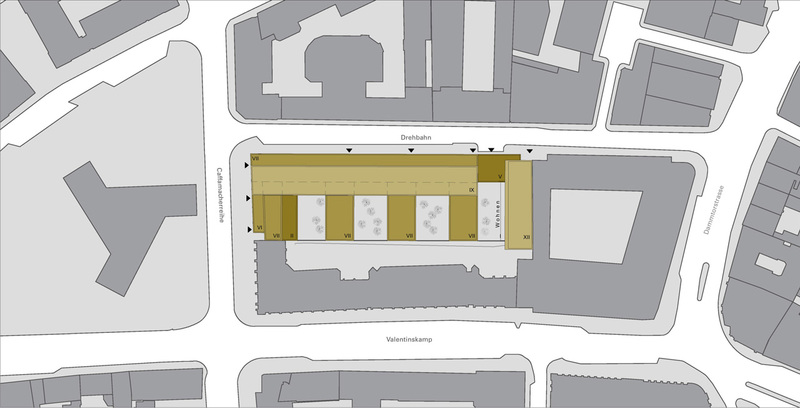 The basement houses a conventional underground car park with 86 parking spaces with ramp access to Bessemerstrasse. 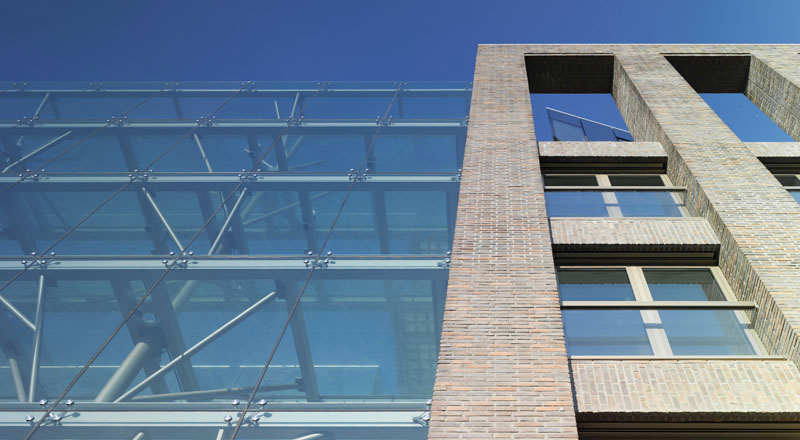 The exterior appearance is defined by clinker masonry with a perforated façade or, in the case of the inner side looking onto the glass-roofed hall, by an aluminium and glass facade. 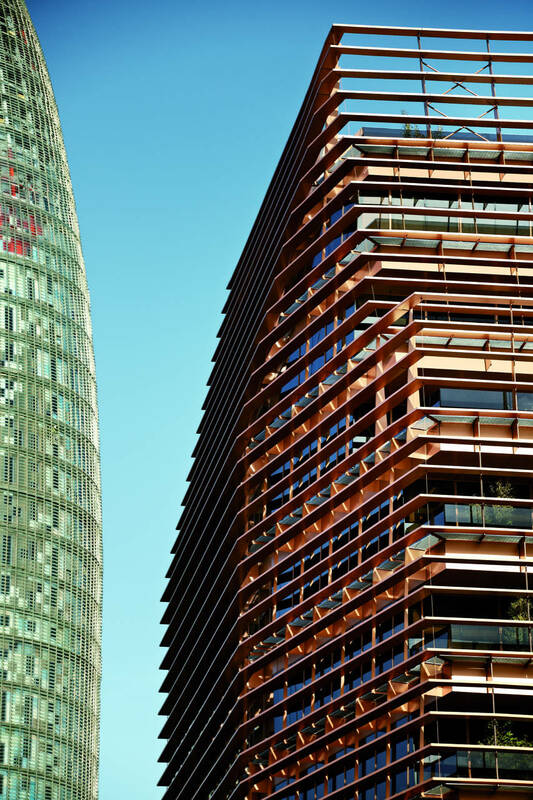 The perforated façade contains stove-enamelled aluminium windows. 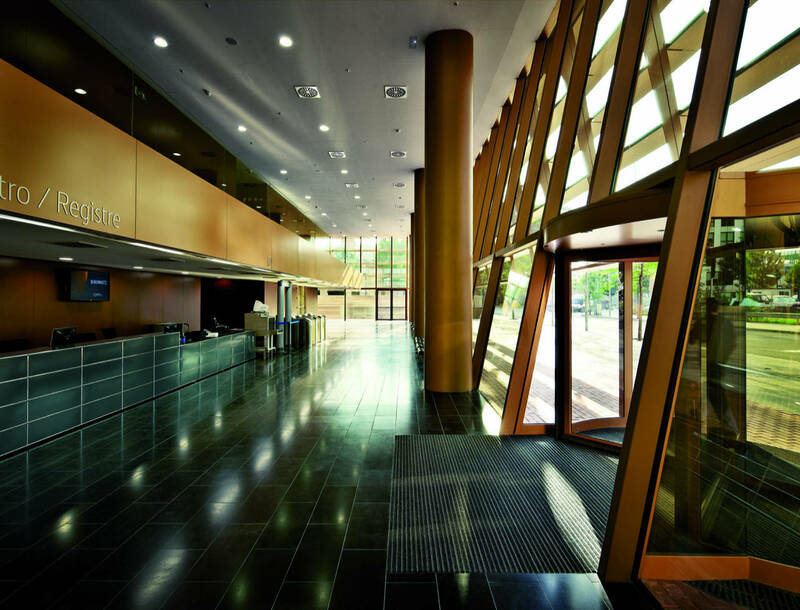 The facades of both blocks which look inwards onto the reception hall are of glass. 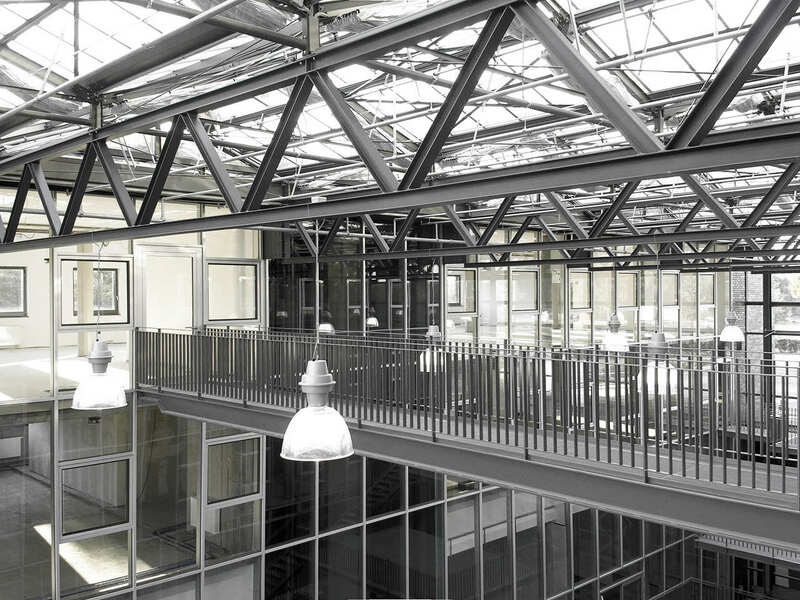 The hall’s load-bearing structure is made of steel. The roofs are flat. 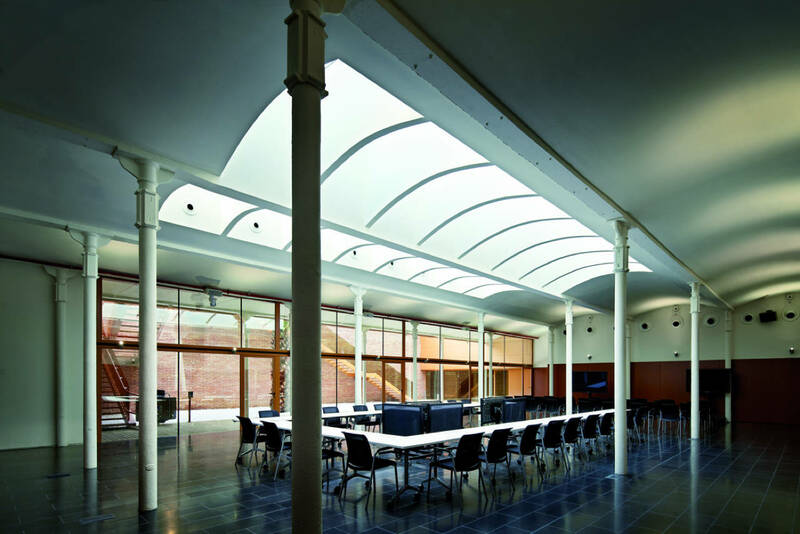 The glass-roofed hall has a roof composed of overlapping glass panels with a suspended, movable, textile sunshade (greenhouse-type shade netting). 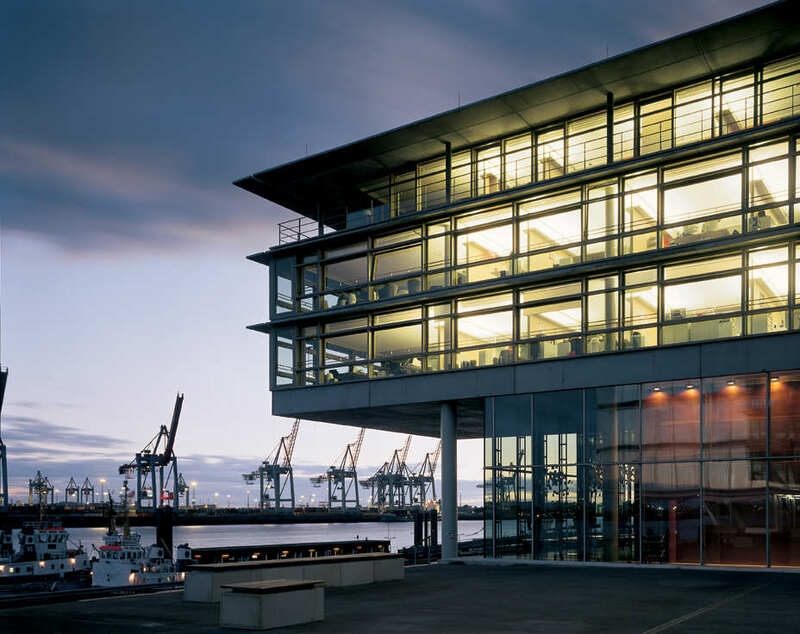 The new headquarters for Edel Music AG are located in a five-story building designed by Antonio Citterio and Partners along the river Elbe in Hamburg, Germany. 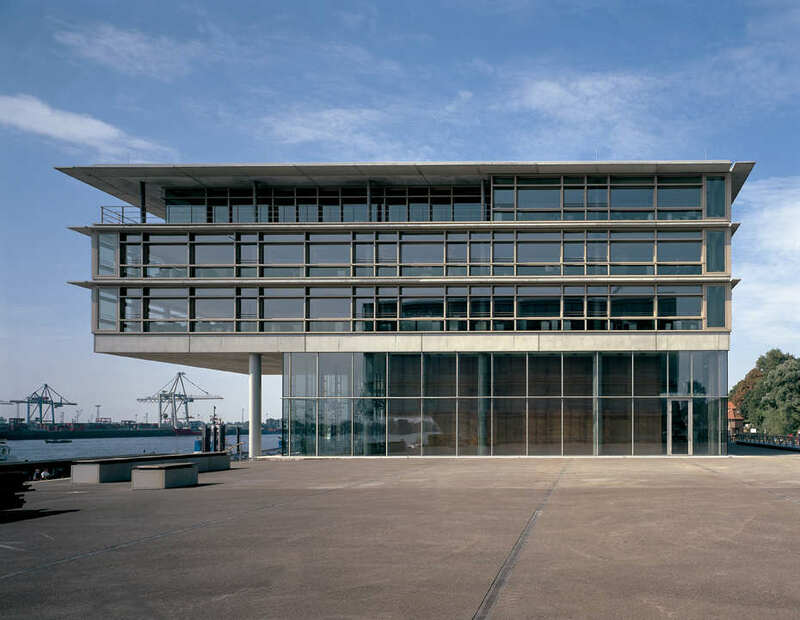 The volume of the building is based on a Master Plan in which a lowered garage structure aligned to the street is topped by several office building facing the river. 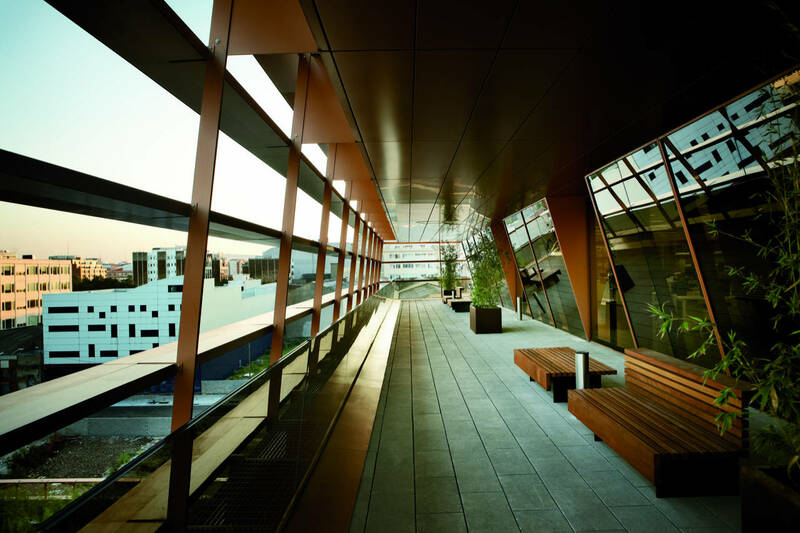 The Edel headquarters comprise 3300 sq meters of office space on three levels over a ground floor housing the reception, bar, restaurant and auditorium. 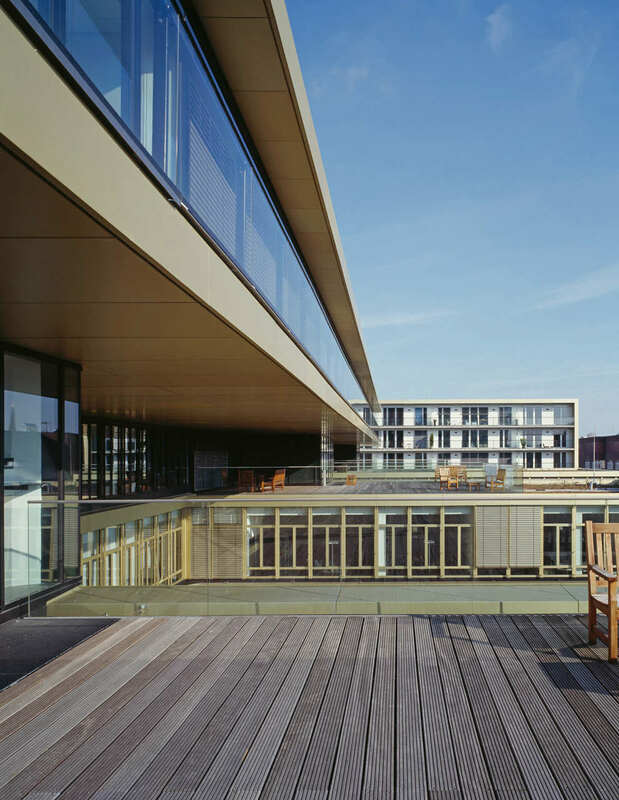 The first two levels are sitting completely on the podium, while the three upper levels cantiliver over the polder, overlooking the river. 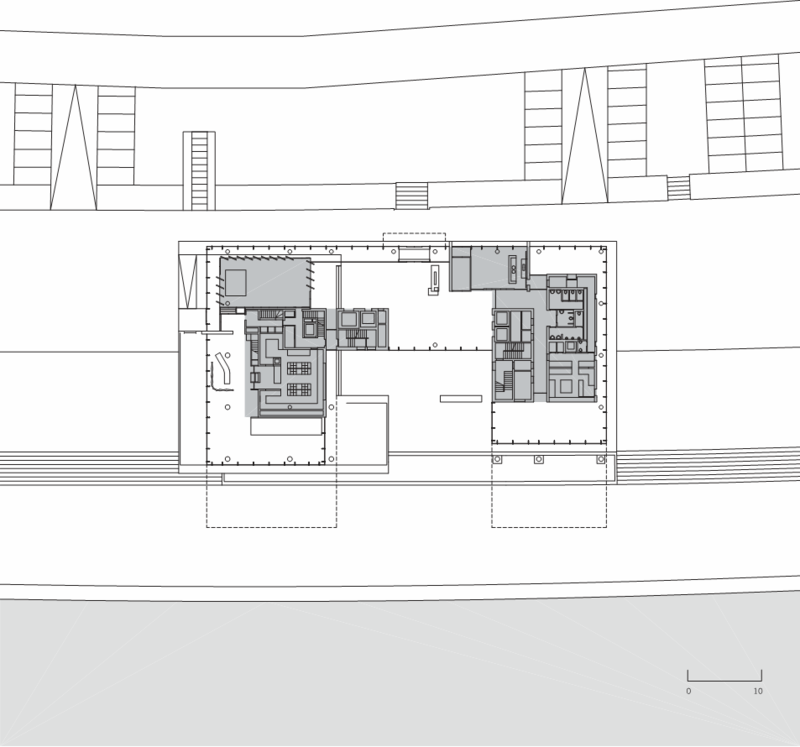 The transparency of the ground floor indicates the public character of the interior: the space is extended to the outside terraces. 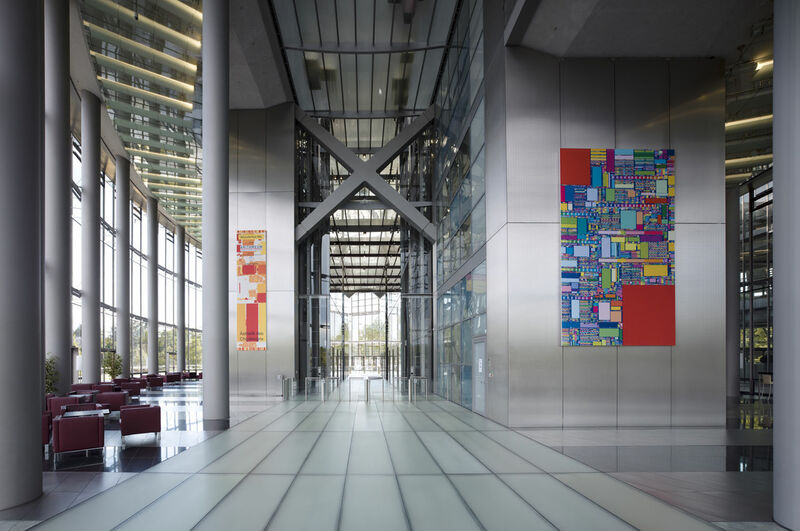 The idea of the building is different from the usual office building, nearing the idea of the “campus” where young people have the chance to meet the employees of the company and communicate with visitors from all over the world. 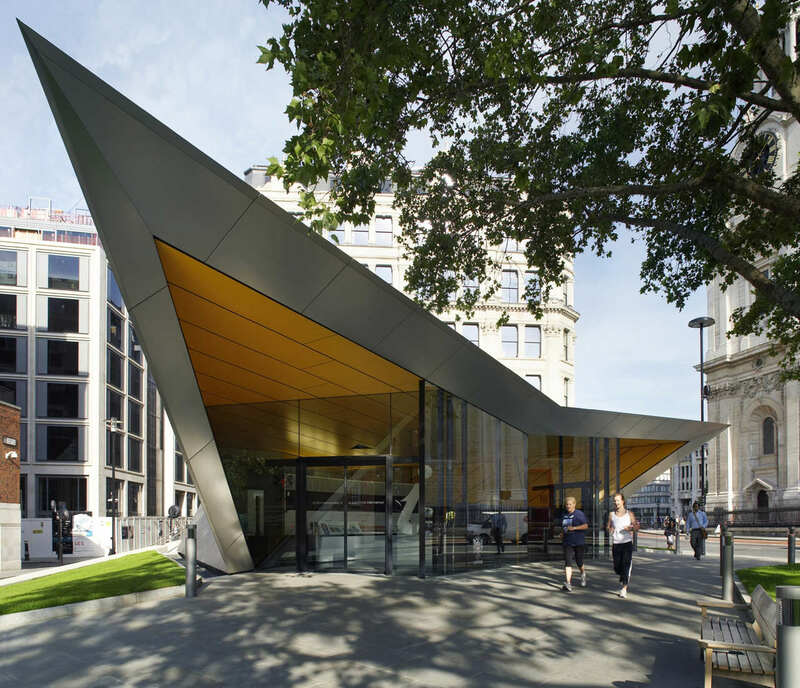 Situated opposite the South Transept of St Paul’s Cathedral, the City of London Information Centre introduces a dynamic contemporary structure to an area of exceptional architectural and urban heritage. 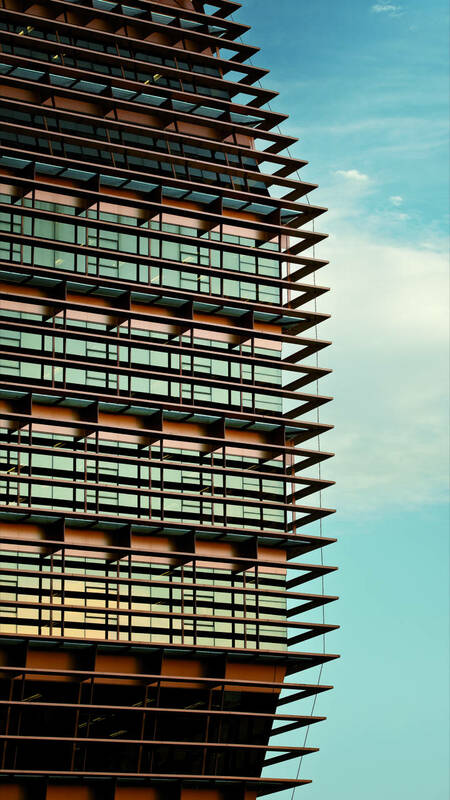 In form, the building combines simplicity and efficiency of structure with a distinctive visual impact. 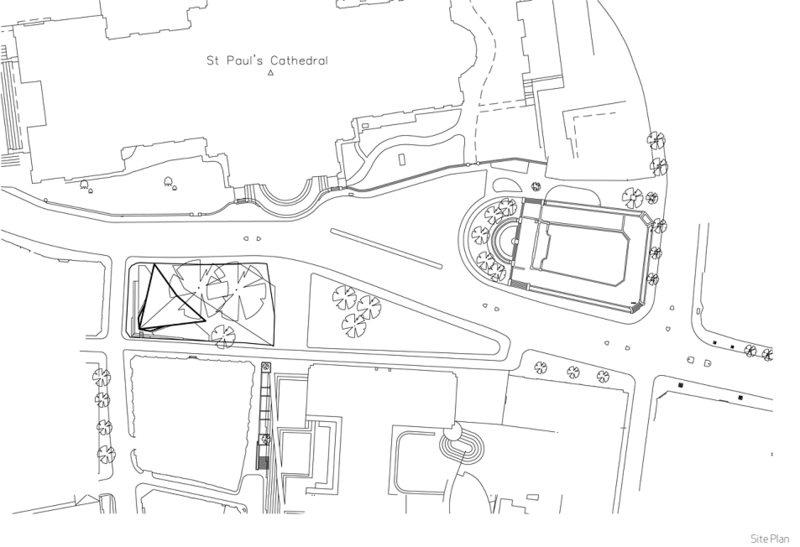 The triangular plan has evolved from analysis of principal pedestrian flows across the site, while the orientation and profile establish an intriguing dialogue with St Paul’s as the building looks up to its prestigious neighbour and opens out to welcome people approaching it. 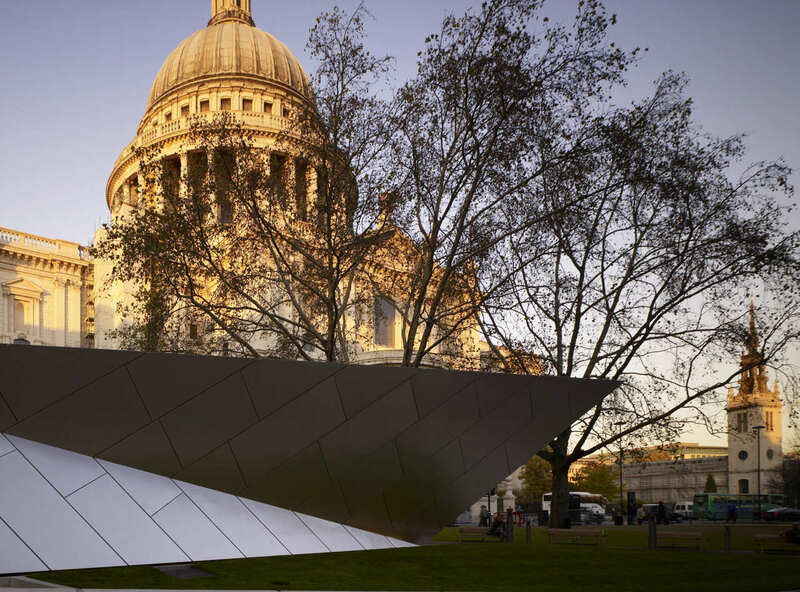 A folded metallic envelope evokes the aerodynamic profile of a paper aeroplane, seamlessly wrapping 140m2 of internal accommodation and formed by a steel frame braced with structural ply and clad in 220 pre-finished stainless steel panels. 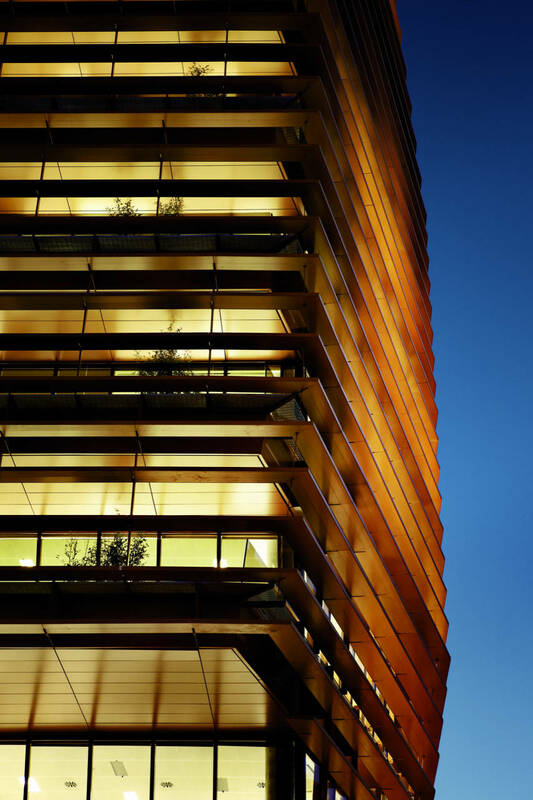 The building meets exacting environmental standards and has been engineered to exceed current Part L targets for C02 emissions by 20 per cent. 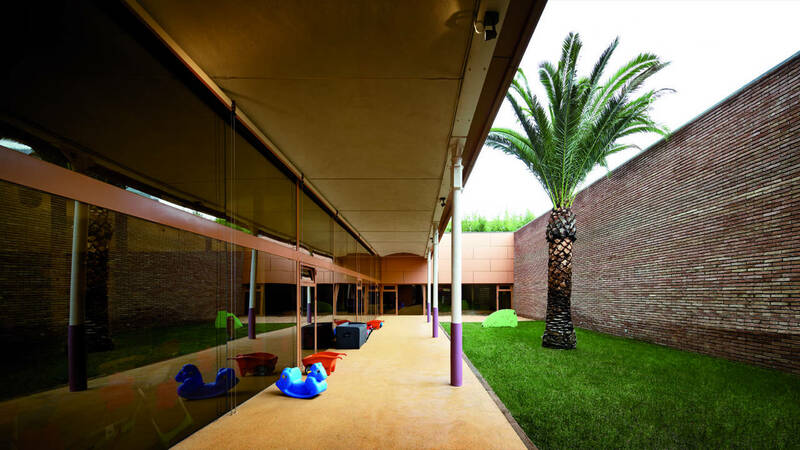 The structure’s envelope is highly insulated, the interior environment is regulated using borehole cooling and the sloping roof facilitates the collection of rainwater which is used to flush toilets and irrigate planting nearby.